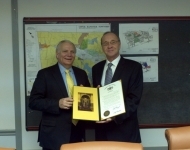 Senator Mensch presented East Greenville Borough Fire company with a citation to commemorate their 85th annual santa run. 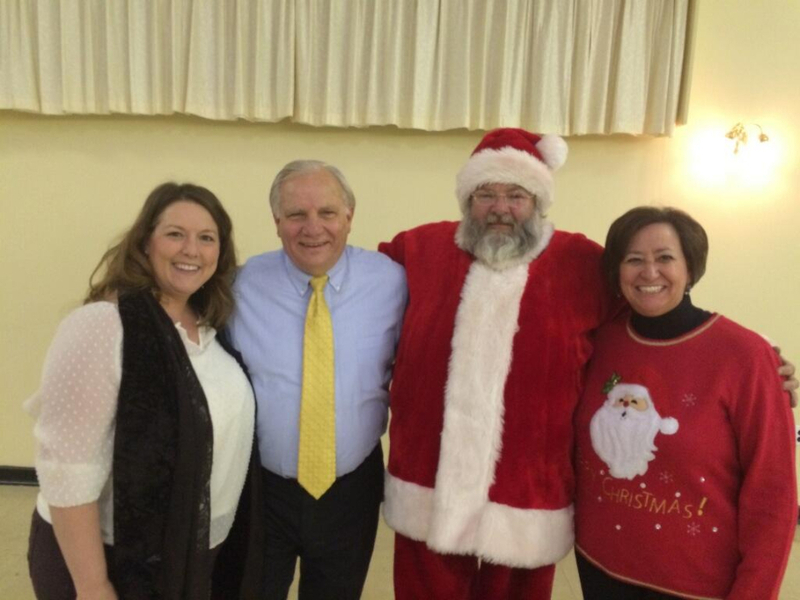 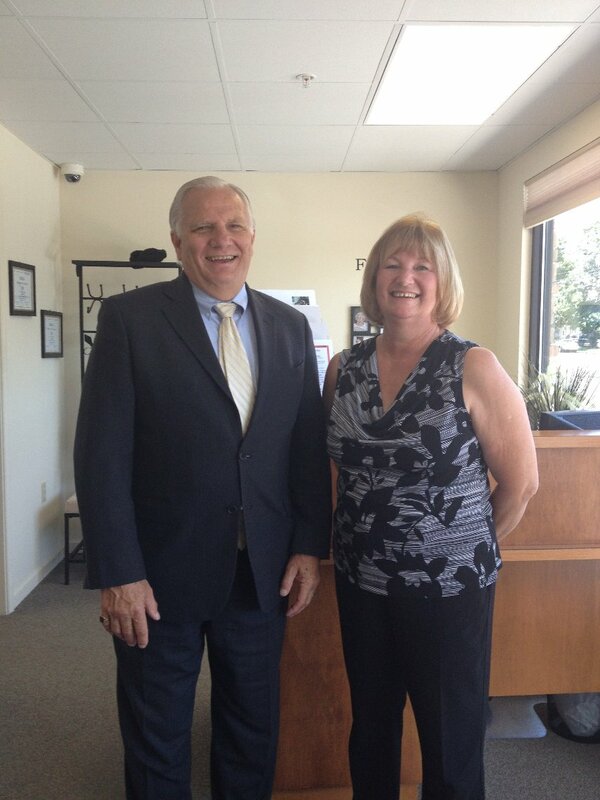 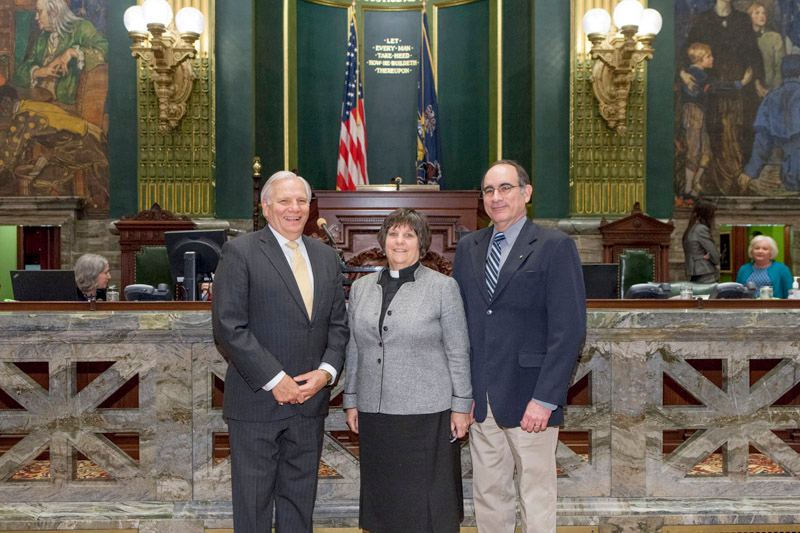 Also pictured is (left) Lynn Wolfe, Green Lane Borough Mayor, and Representative Marcy Toepel (right). 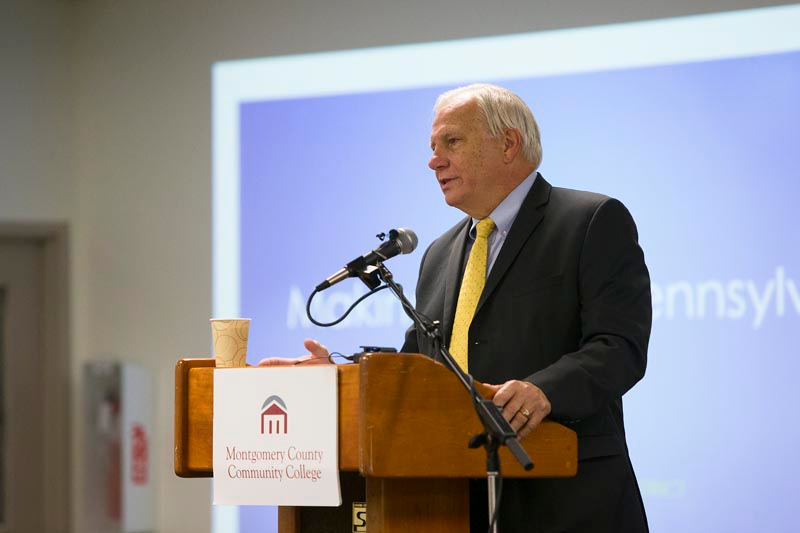 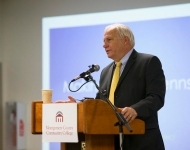 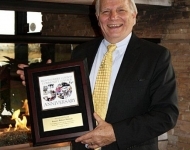 Montgomery County Community College awarded Senator Mensch with the Presidential Award. 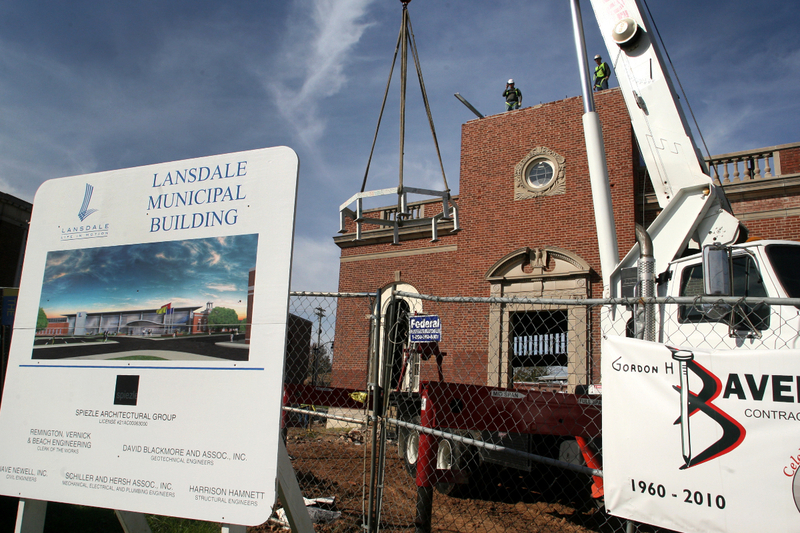 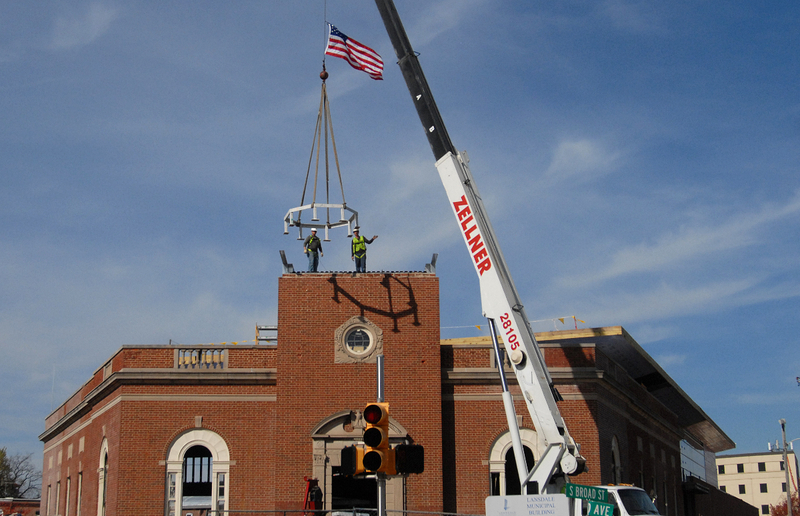 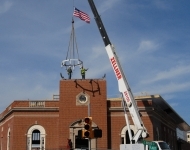 On November 4, Senator Mensch witnessed the Cupola Support Structure "Top Off" on the Lansdale Borough Municipal Complex. 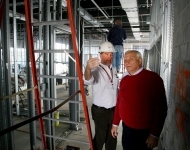 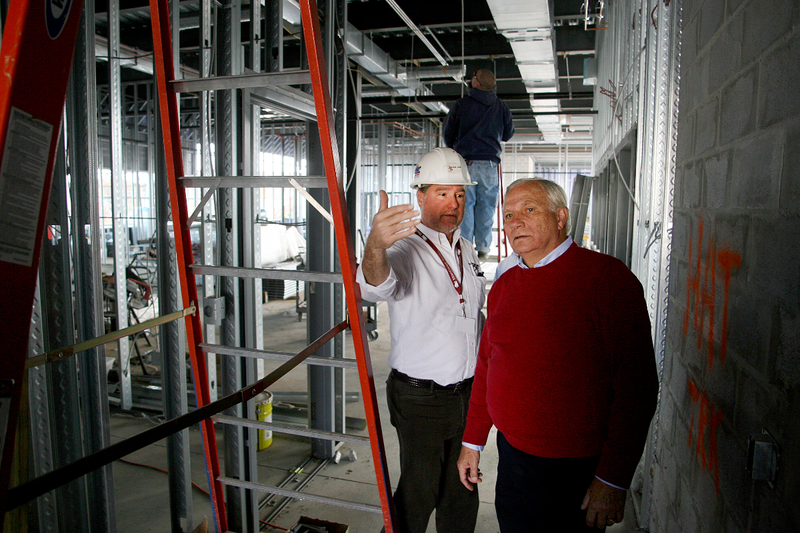 He also took a tour of the new municipal building. 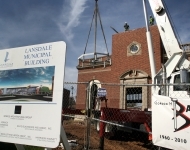 On November 4, Senator Mensch witnessed the Cupola Support Structure "Top Off" on the Lansdale Borough Municipal Complex. 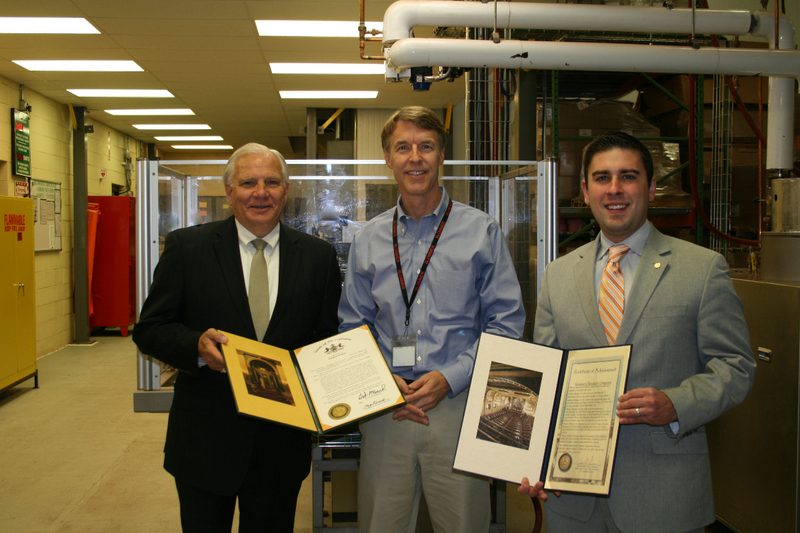 Senator Mensch congratulated Blommer Chocolate Company on their 75th anniversary by presenting them with a citation along with Representative Justin Simmons. 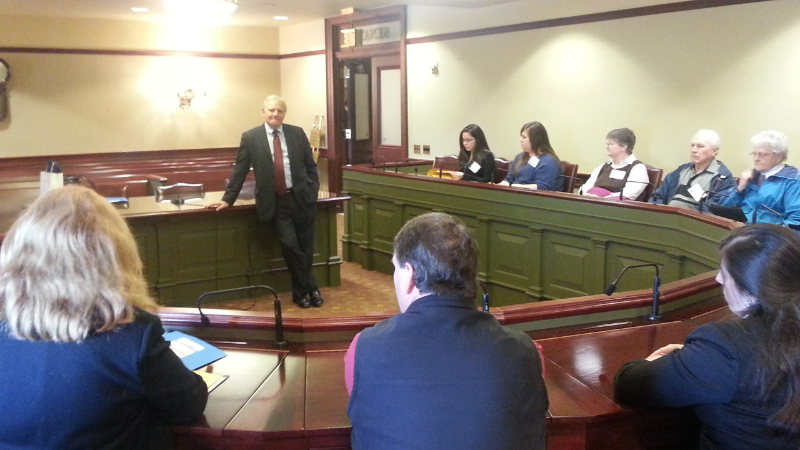 Senator Mensch welcomed students from various school districts to his annual Senator for a Day seminar. 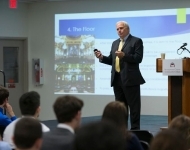 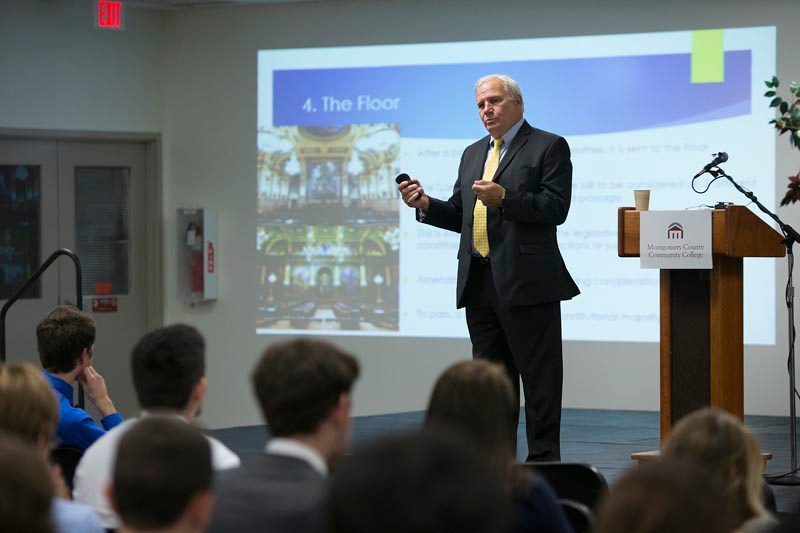 Senator Mensch explained how a bill becomes a law in Pennsylvania to students at his annual Senator for a Day seminar. 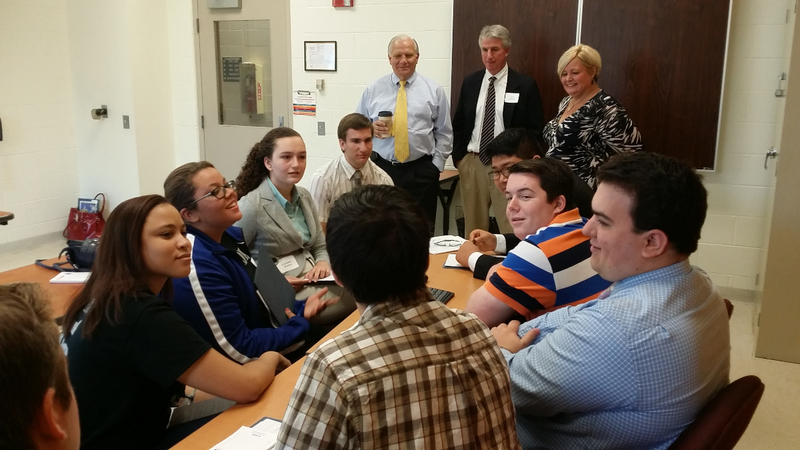 Senator Mensch listened to students discuss legislation in their committee. 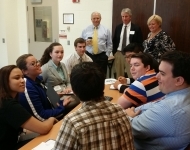 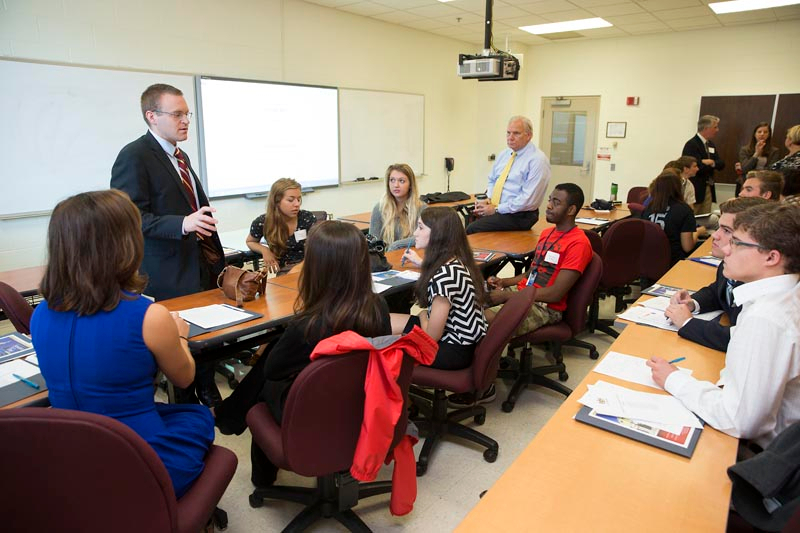 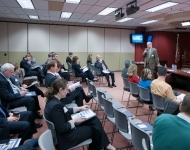 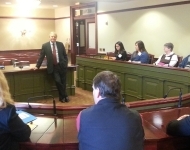 Senator Mensch enjoyed meeting lobbyists and students during his annual Senator for a Day seminar. 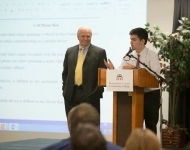 Students presented bills to the floor during Senator Mensch’s annual Senator for a Day seminar. 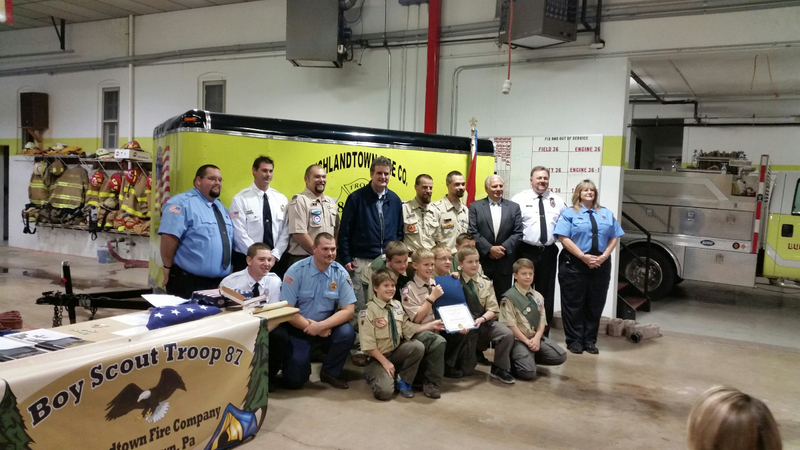 Senator Mensch joined Congressman Fitzpatrick in presenting Boy Scout Troop 87 of Richlandtown with a US flag and PA flag. 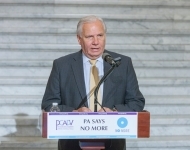 Senator Mensch participated in the PA Coalition Against Domestic Violence Ceremony by reading the names of of people who were killed as a result of domestic violence in PA. October is Domestic Violence Awareness Month and each year Pennsylvanians are killed at the hands of their intimate partner. 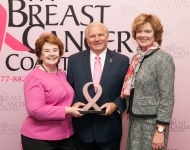 Senator Mensch received the PA Breast Cancer Coalition Pink Ribbon Award for his legislative action on SB 358, now Act 89. 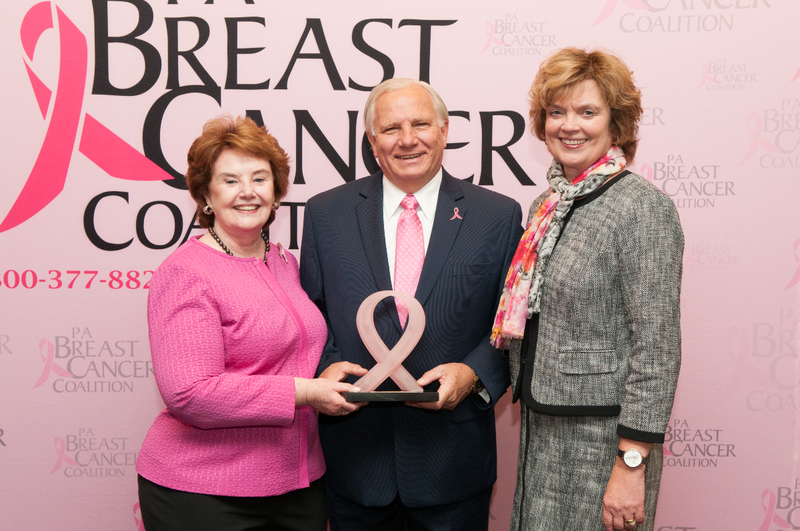 PBCC President and Founder, Pat Halpin-Murphy, and First Lady Susan Corbett congratulated the Senator on his achievements. 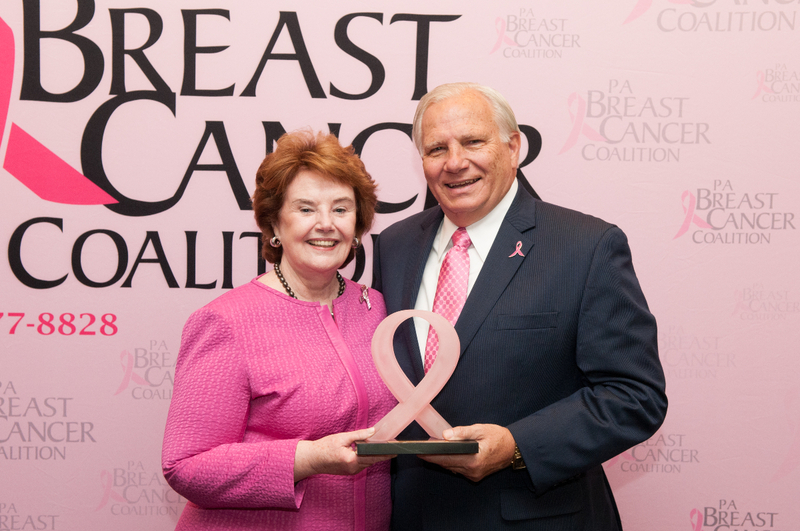 Senator Mensch received the PA Breast Cancer Coalition Pink Ribbon Award for his legislative action on SB 358, now Act 89. 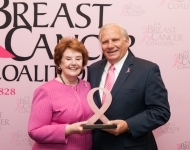 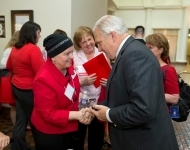 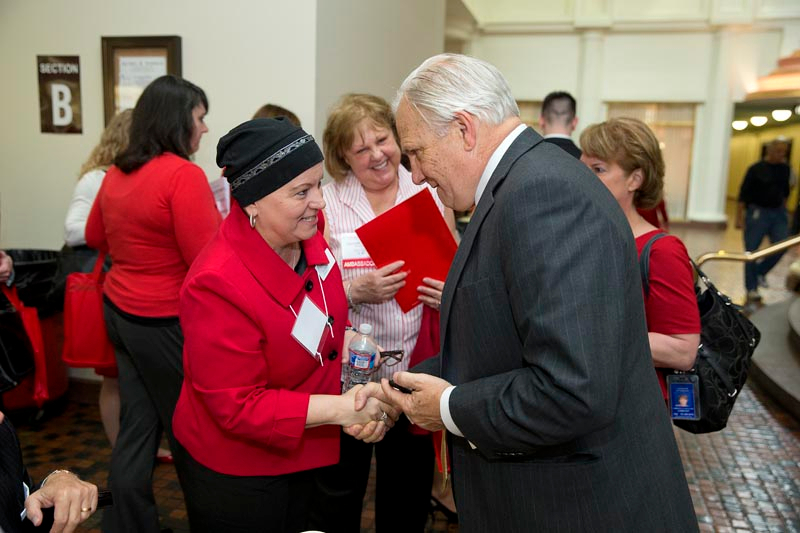 PBCC President and Founder, Pat Halpin-Murphy, presents Senator Mensch with the award. 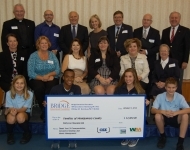 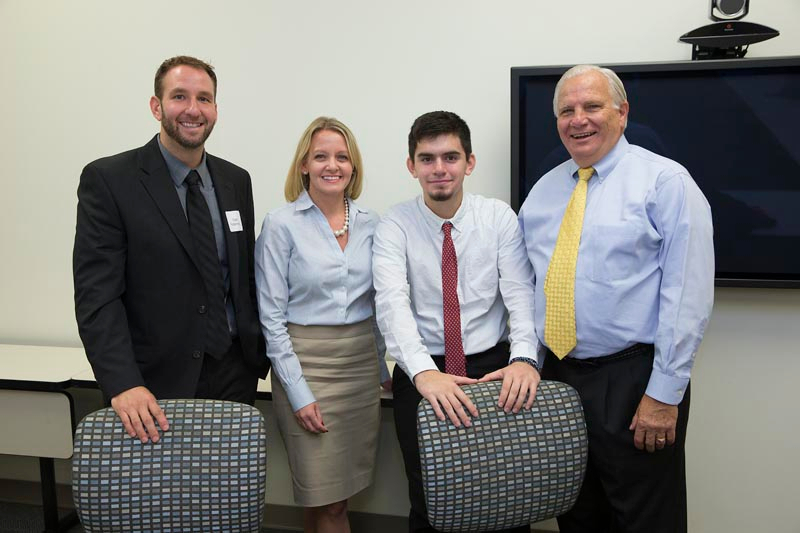 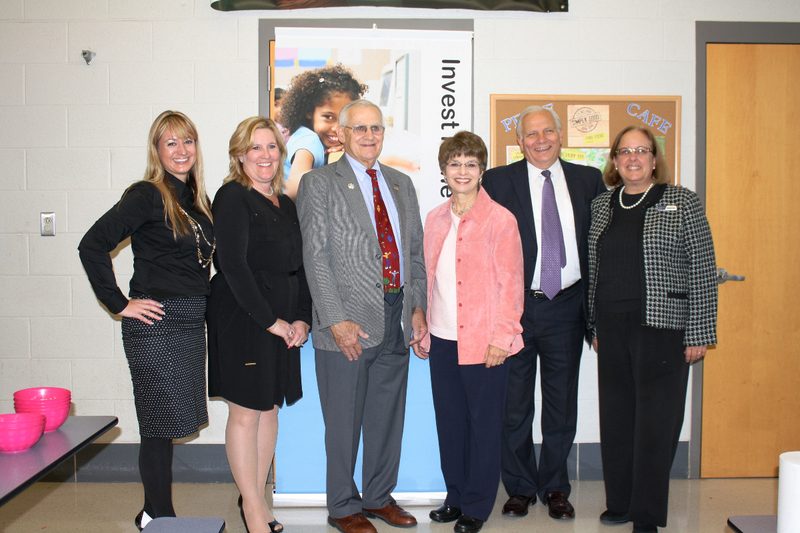 Senator Mensch participated in the Bridge Educational Foundation’s scholarship ceremony. 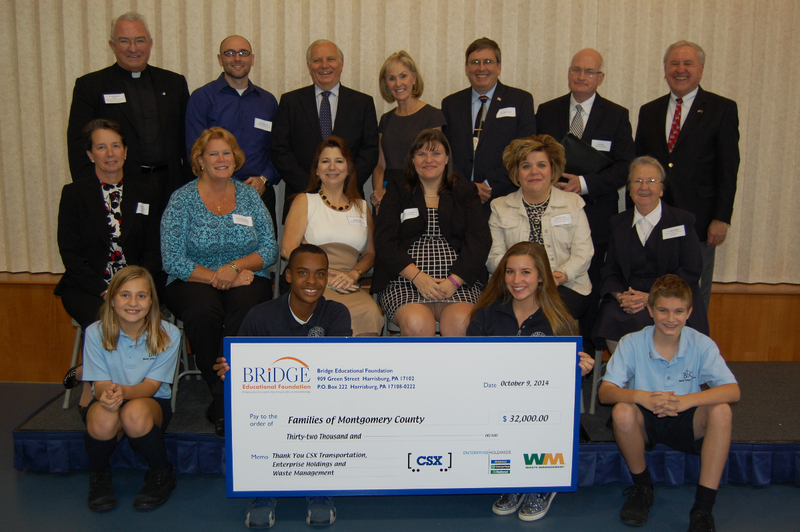 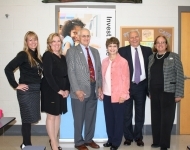 The Bridge Educational Foundation and CSX Transportation, Enterprise Holdings and Waste Management are donating $32,000 of scholarship money to the families of Montgomery County. 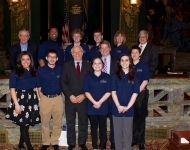 Scholarship funds are made possible through Pennsylvania’s Educational Improvement Tax Credit (EITC) Program. 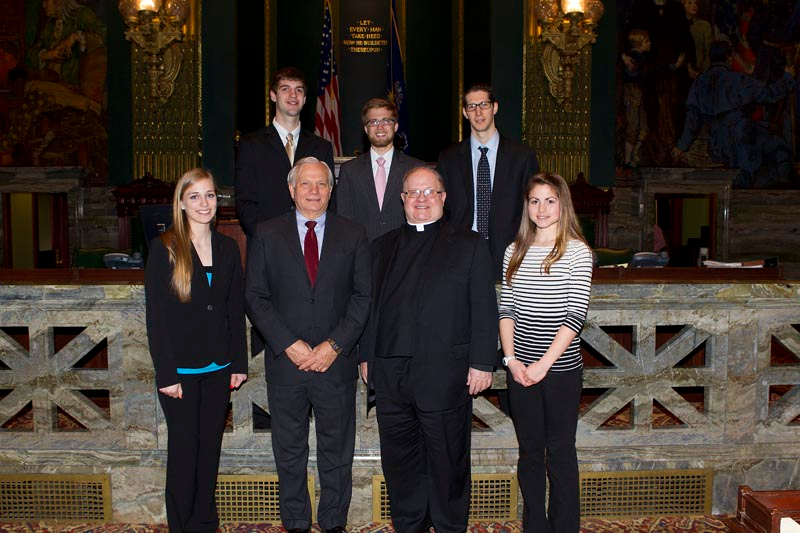 The photo was taken with members from Blessed Teresa of Calcutta. 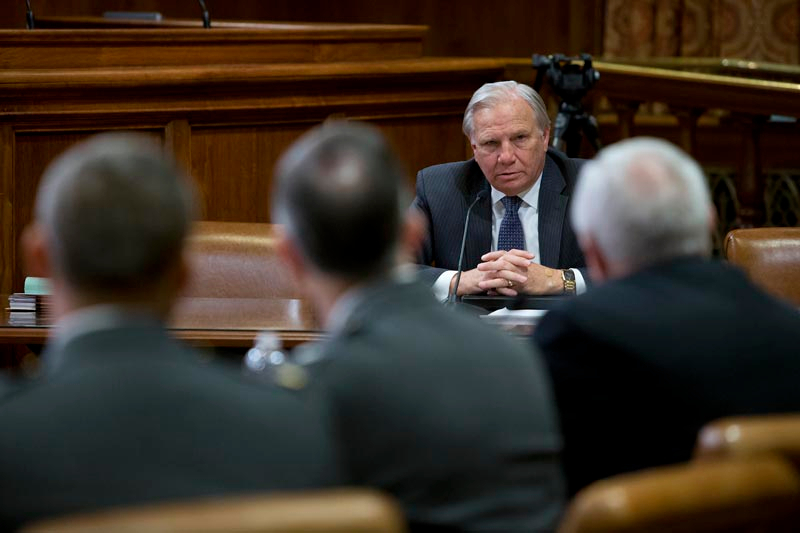 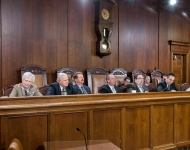 The Senate Veterans Affairs and Emergency Preparedness Committee, chaired by Senator Mensch, held a public hearing Wednesday to consider the promotions of the following Pennsylvania National Guard members: Brigadier General, PA Air National Guard: Colonel Alan K. Hodgdon and Colonel Edward E. Metzgar; Major General, PA Army National Guard: Brigadier General Timothy J. Hilty and Brigadier General Walter T. Lord; and Brigadier General, PA Army National Guard: Colonel Mark D. McCormack, Colonel Scott G. Perry and Colonel David E. Wood. 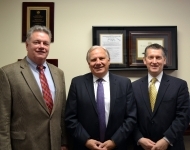 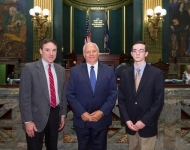 Also photographed are Senator Mensch, Senator Brubaker, and Senator Wagner. 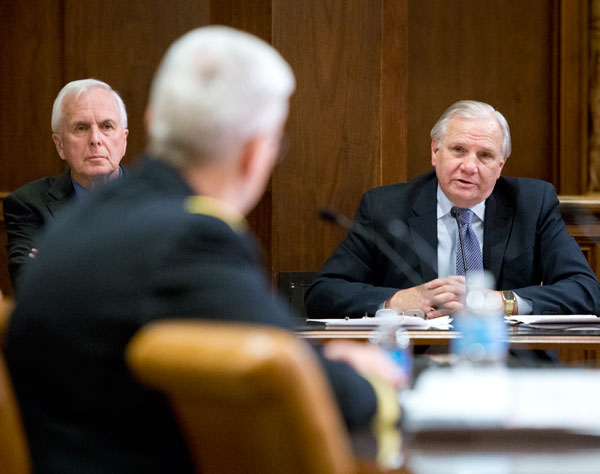 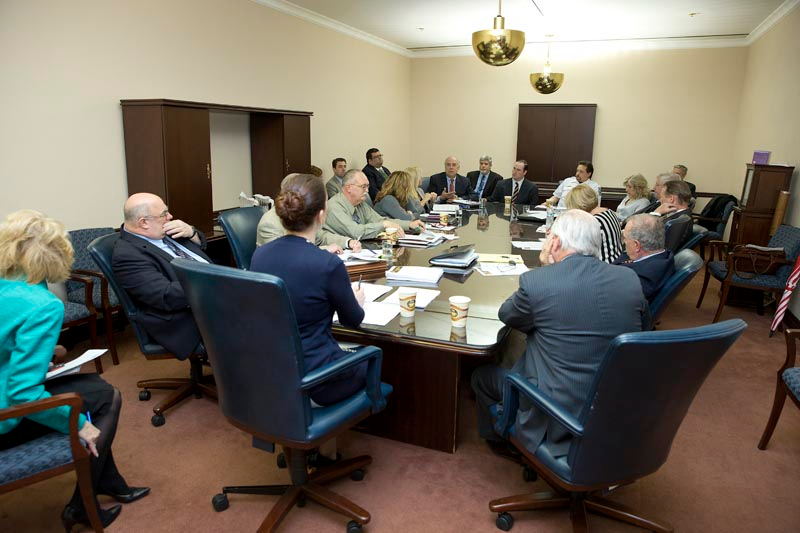 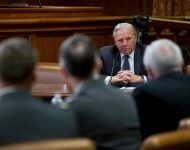 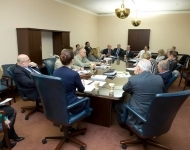 The nominations were favorably reported to the Rules and Executive Nominations Committee in advance of consideration by the full Senate. 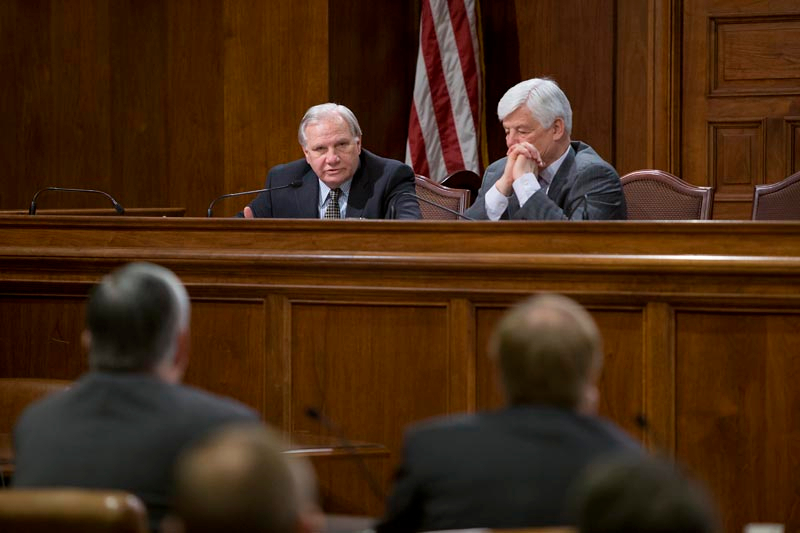 You can view the hearing here. Senator Mensch joined constituents at the NAVRATRI Celebrations in Montgomery County. 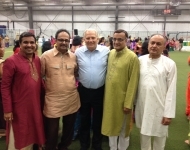 L to R: Mr. Ragesh Patel, Naresh Padhiar, Senator Mensch, Mr. Bhupesh Shah, Dr. P.G. 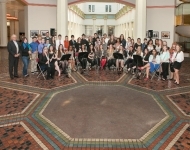 Patel. 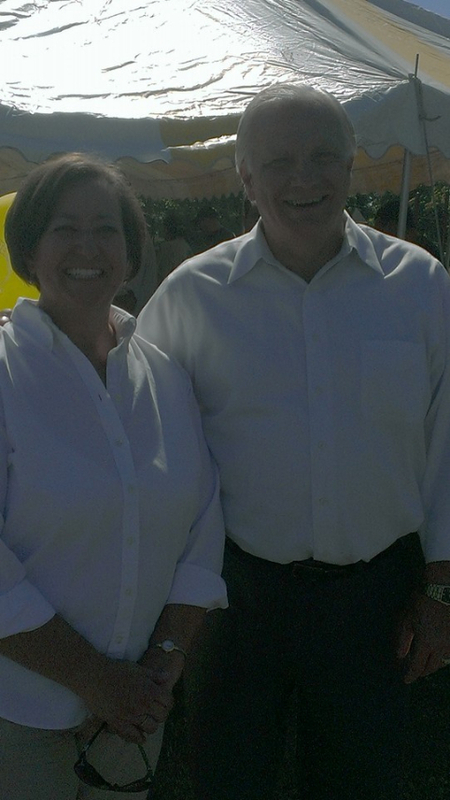 Senator Mensch and Representative Marcy Toepel pose for a picture during Upper Frederick’s Community Day and return to talking to constituents. 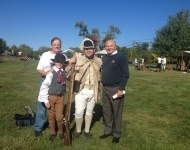 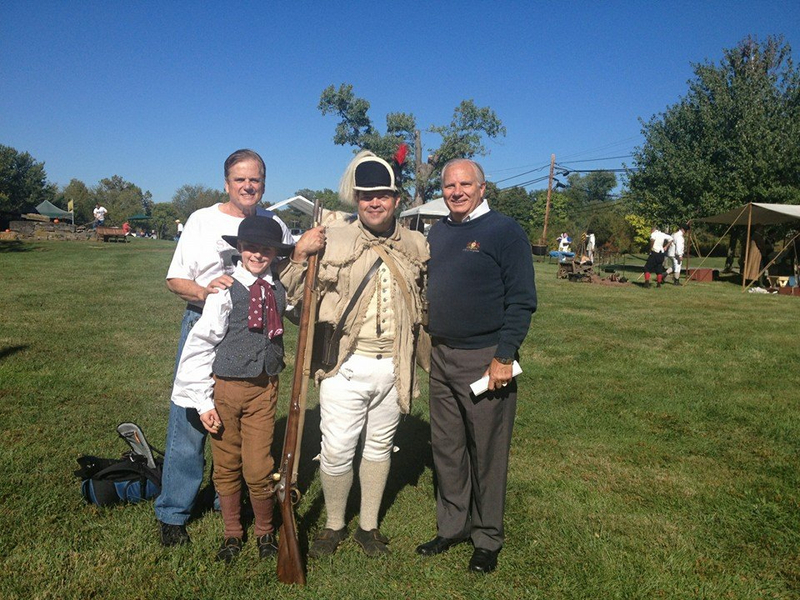 Senator Mensch enjoyed visiting the Washington Encampment event in Skippack Township. 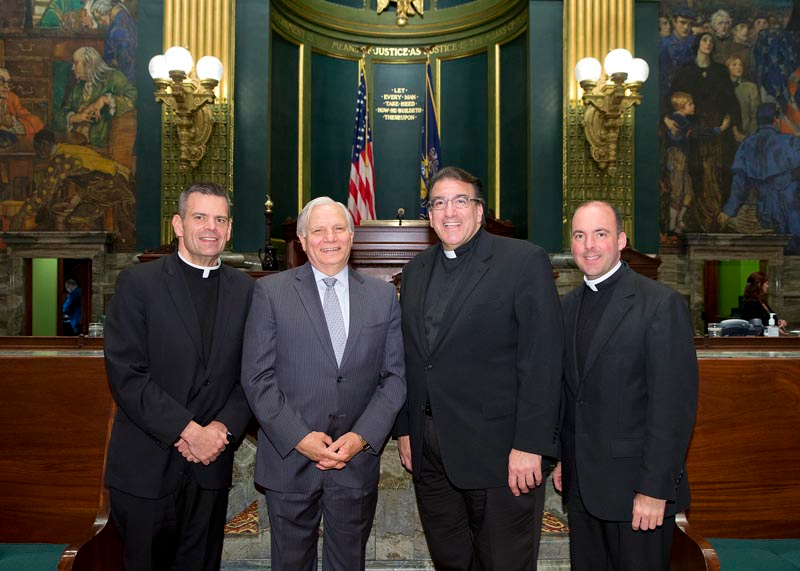 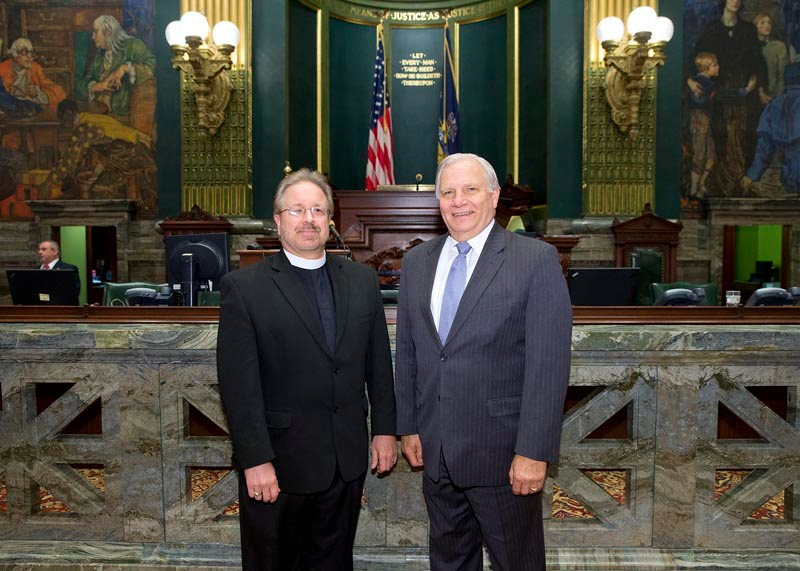 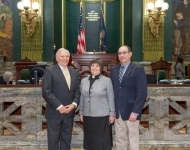 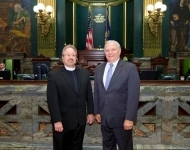 Senator Mensch hosted the guest chaplain of the Senate, Reverend David McKinley from the Central Schwenkfelder Church in Lansdale, PA. Reverend McKinley was accompanied by several members of the Central Schwenkfelder Church. 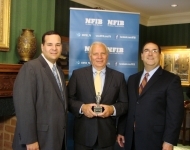 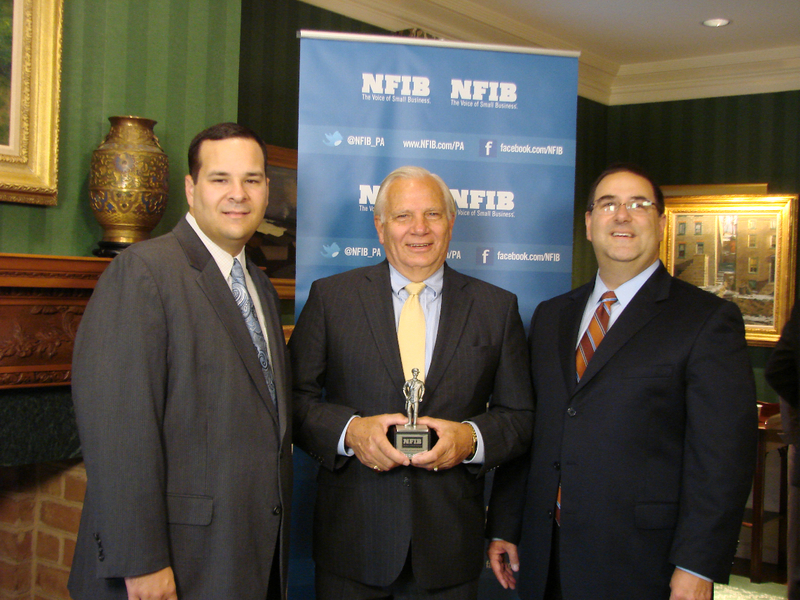 Senator Mensch was honored to receive the National Federation of Independent Business’s “Guardian of Small Business” award for his support of small businesses. 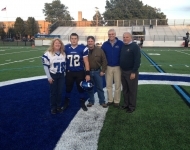 Senator Mensch visited Quakertown Community School District’s new alumni turf field and watched the home game featuring Quakertown vs. William Tennent High School. 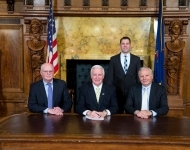 Pictured L to R: Bonnie Caroff, Gavin Caroff, John Caroff, Paul Stepanoff, and Senator Mensch. 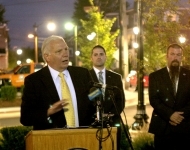 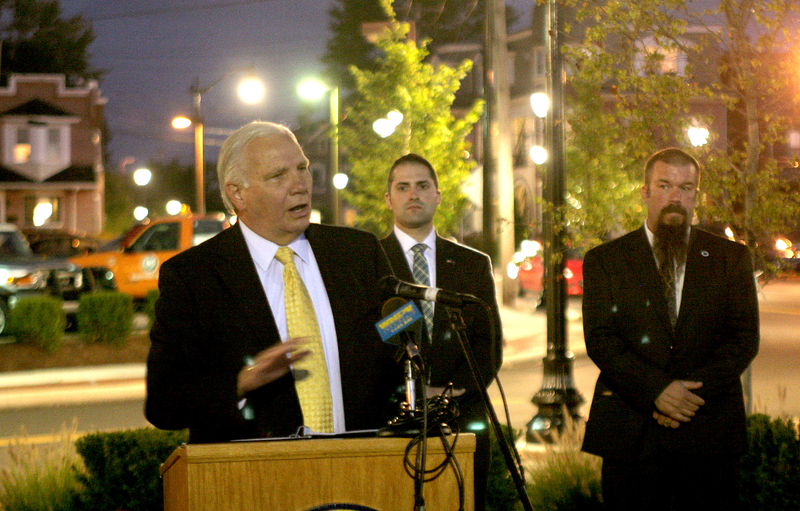 Senator Mensch spoke during the PCTI Wood-Vine Connector Project ribbon cutting in the Borough of Lansdale. 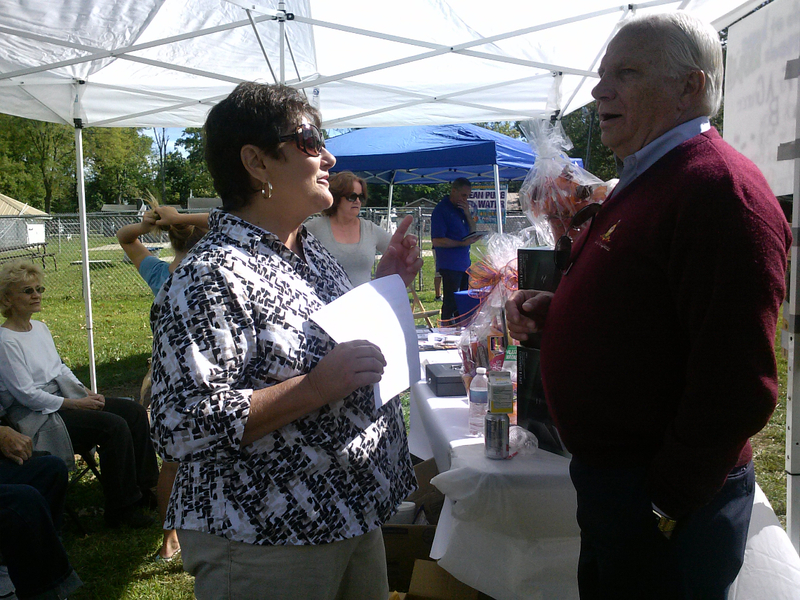 Senator Mensch enjoyed speaking with constituent Pat Erb at New Hanover's Fall Frolic. 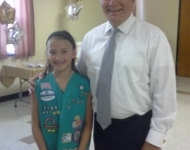 They discussed Senate legislation and the non-profit organization she is involved with, called Brendan’s Band. 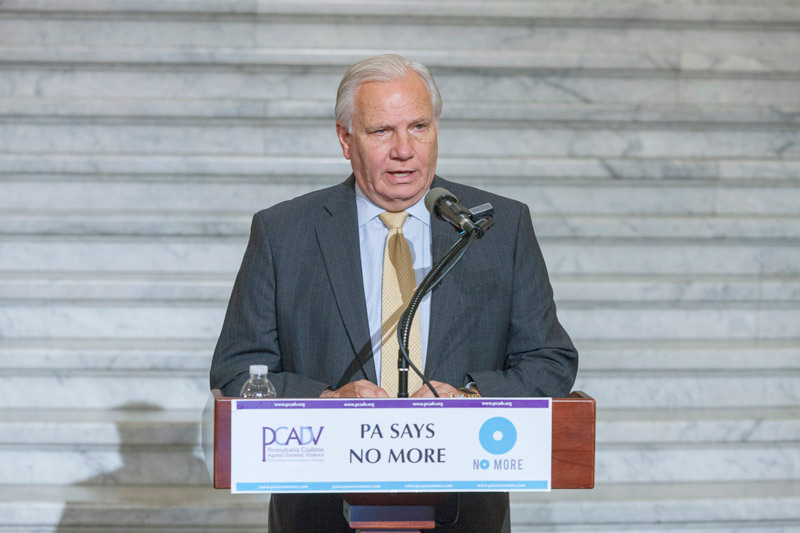 The organization is dedicated to spreading the word on the importance of locking up household over the counter medicines and prescription medications. 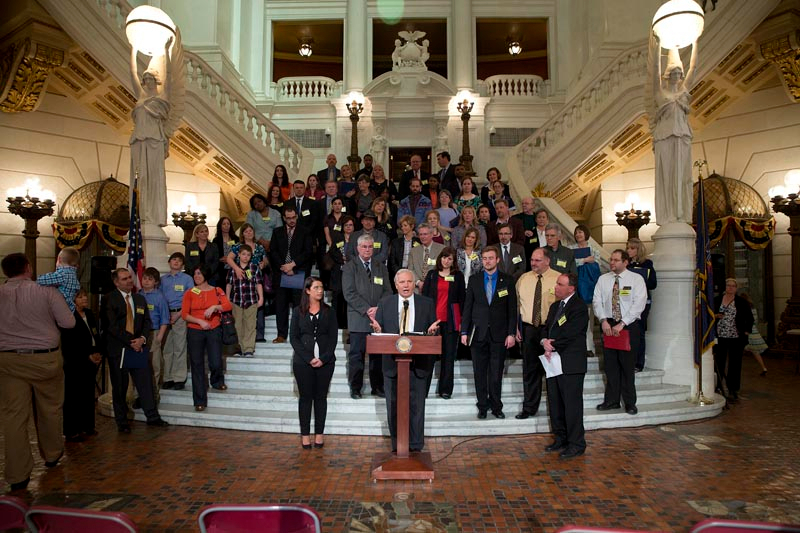 They are also committed to getting the word out on addiction and recovery for those who are in seek of help. 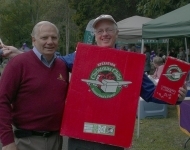 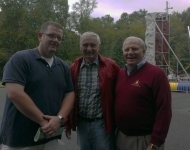 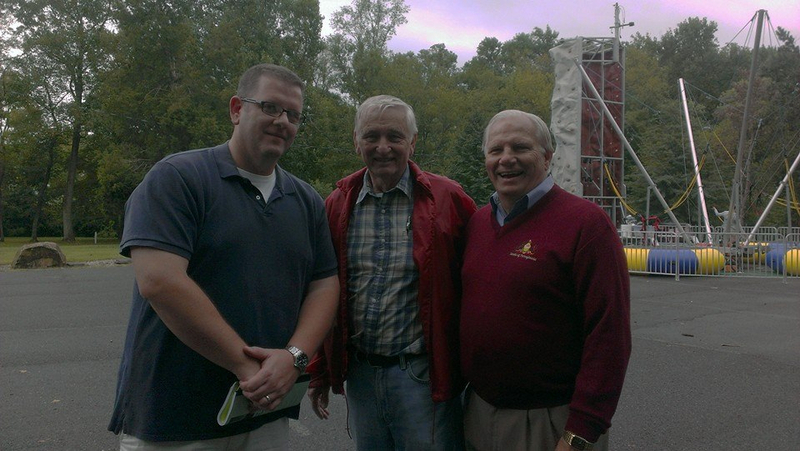 Senator Mensch joined Chuck Goering at the Trappe Community Day in Waterworks Park. 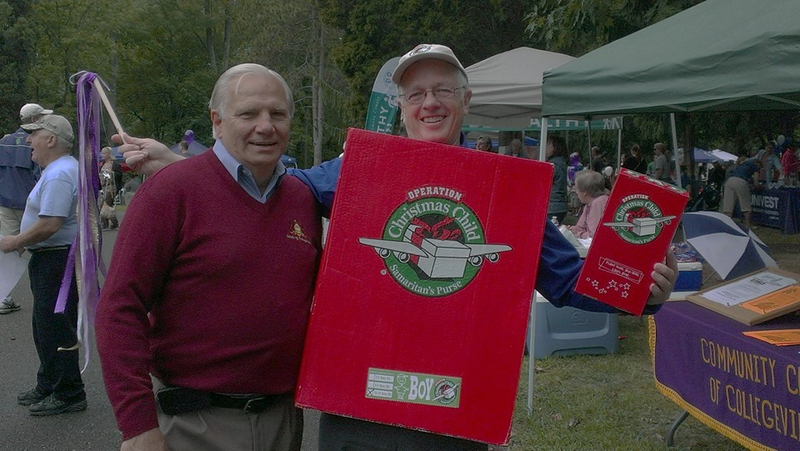 To learn more about Operation Christmas Child, visit here. Senator Mensch enjoyed greeting constituents and discussing state matters at the Borough of Trappe’s Community Day in Waterworks Park. 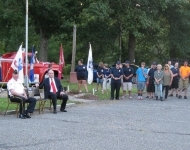 Senator Mensch was honored to speak at the PALM American Legion Perkiomen Post 184’s 9/11 remembrance ceremony. 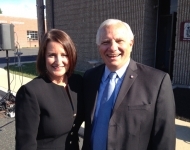 Senator Mensch and Montgomery County District Attorney Risa Vetri Ferman attended New Hanover Police Department’s plaque unveiling ceremony honoring Sergeant A. Wesley Faust. 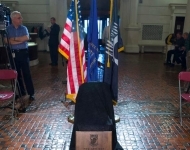 Sgt Faust died in line of duty 5/22/77. 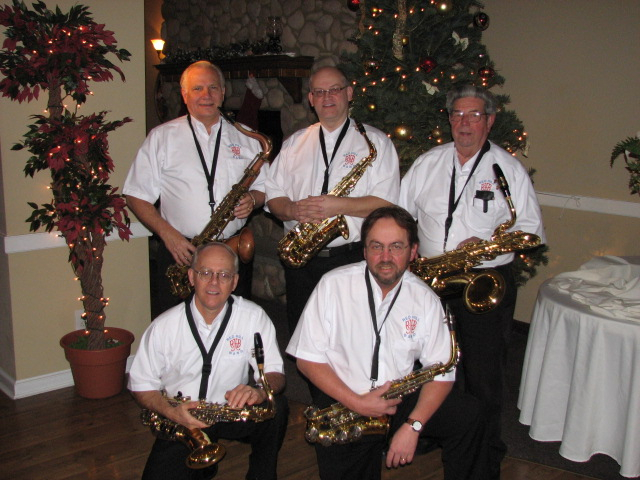 Senator Mensch posed for a picture with the saxophone players in the Red Hill Band. 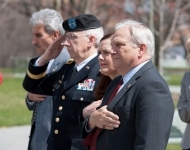 Senator Mensch is an active member of the Red Hill Band. 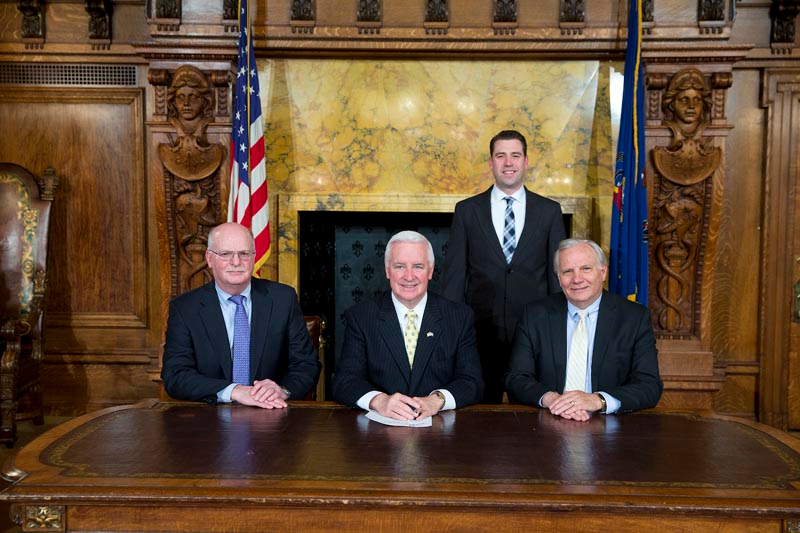 L to R: (Back Row) Senator Mensch, Corey Brackin, Vince Bercher (Front Row) Blair Beard, Bob McNaughton. 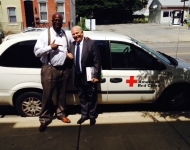 Senator Mensch toured the American Red Cross House of Southeastern Philadelphia with Judge Renee Cardwell Hughes, CEO, and Chad Dion Lassiter, Director of Recovery. 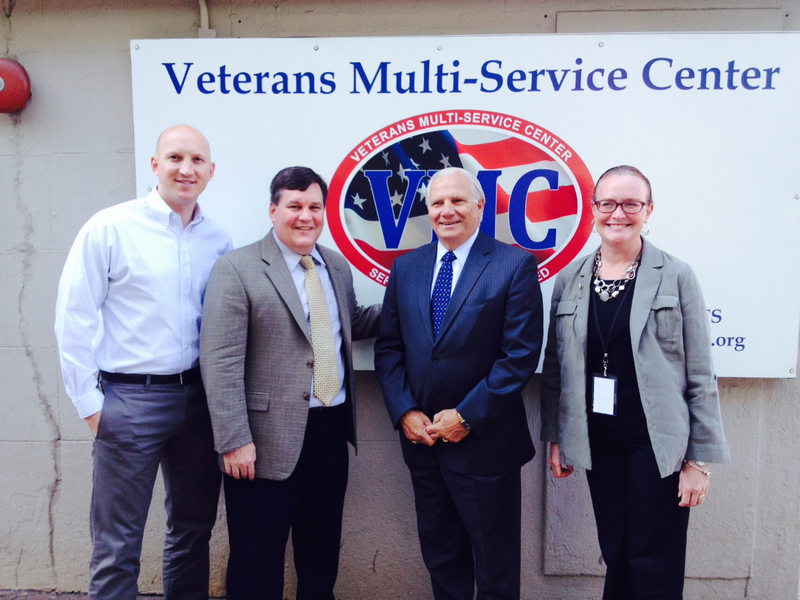 Senator Mensch enjoyed his tour of the Veterans Multi-Service Center in Philadelphia with Tim Meserve, Executive Director of the Veterans Multi-Service Center (VMC), and Bob Lord, President of the Board of Directors. 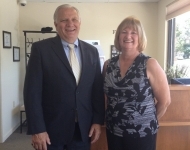 Senator Mensch joined Geri Fioriglio at Family Caregivers in Pennsburg to learn about the in-home services provided to seniors. 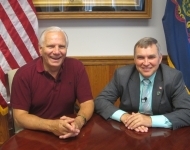 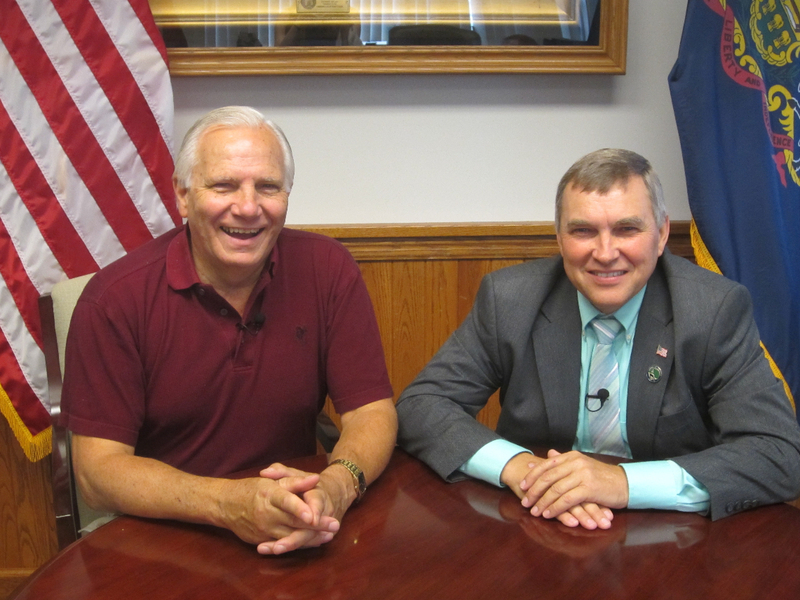 Senator Mensch interviewed Brigadier General (retired) Jerry G. Beck Jr., Deputy Adjutant General - Veterans Affairs, for a Mensch Report show featuring the DMVA. 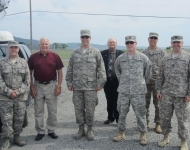 The interview was filmed at Fort Indiantown Gap, Annville, PA. 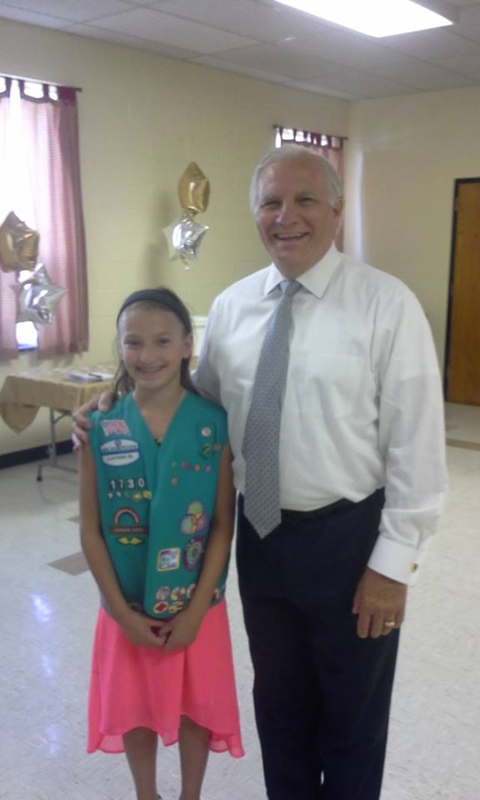 Senator Mensch congratulated Girl Scout Angelique Bauer on receiving her Bronze award at the Girl Scout Award Ceremony in Boyertown. 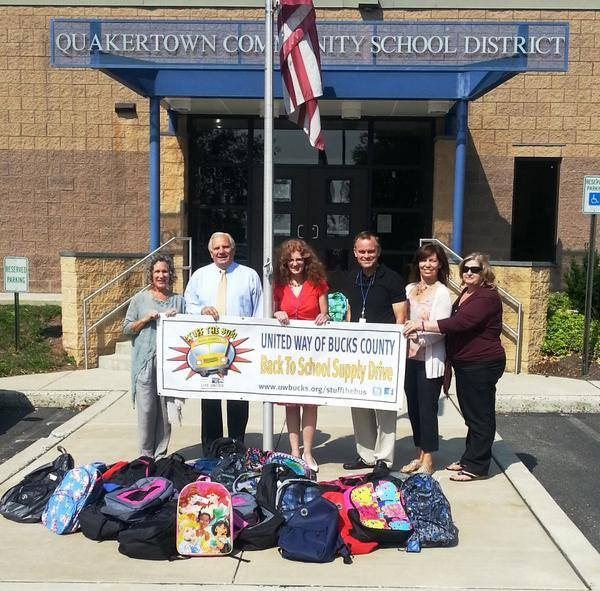 Senator Mensch was honored to meet the volunteers and members involved in the backpack initiative drop off at Quakertown Community School District for United Way of Bucks County's Stuff the Bus program. 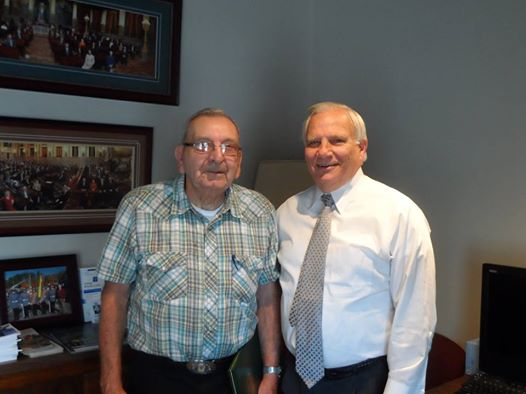 Senator Mensch was honored to present a well-deserved citation to Charles Hartzell for contributing 50 years of service to Green Lane Fire Company. 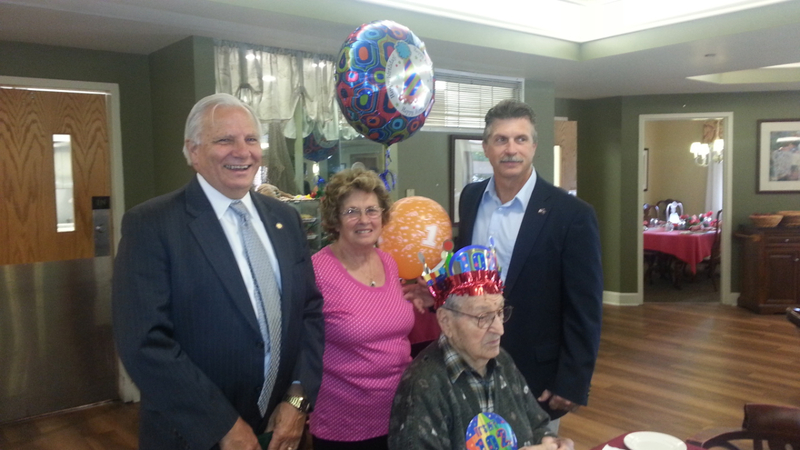 Senator Mensch wished a very happy 102nd birthday to Willard Fisher in Boyertown, PA!! 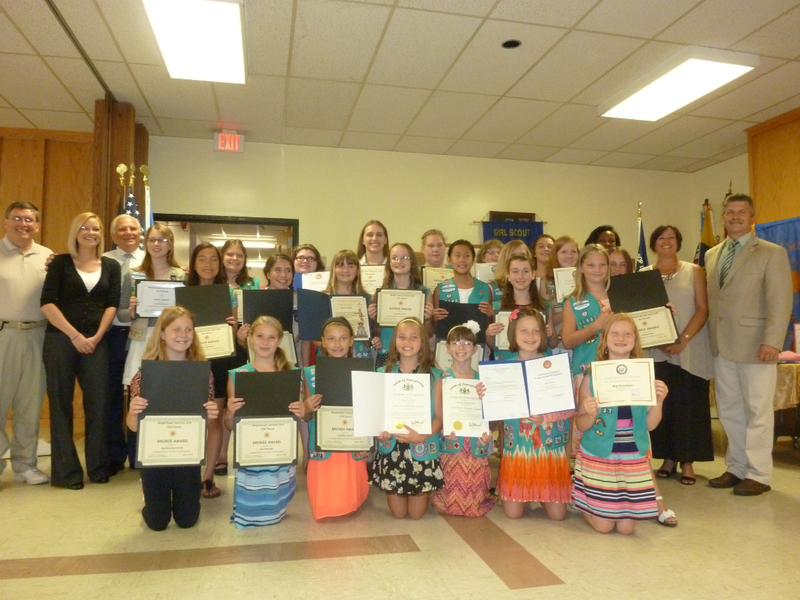 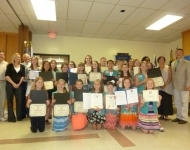 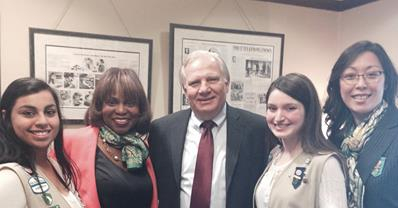 Senator Mensch presented certificates to Girl Scouts in the Berks County Area who were recognized with Bronze awards. 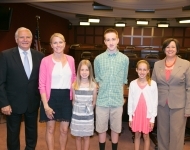 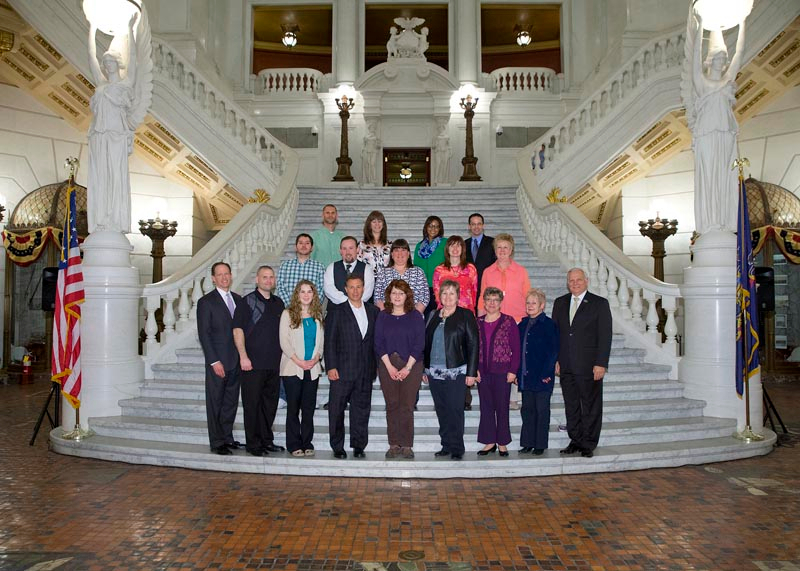 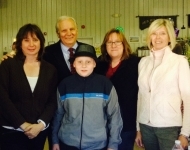 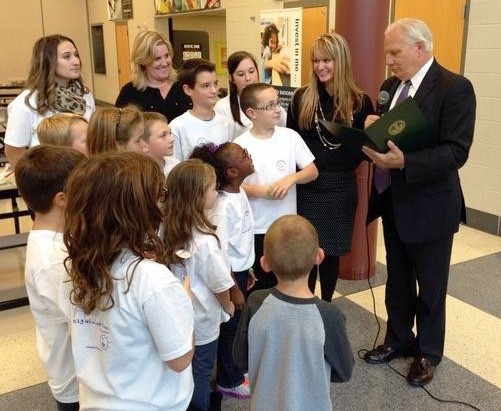 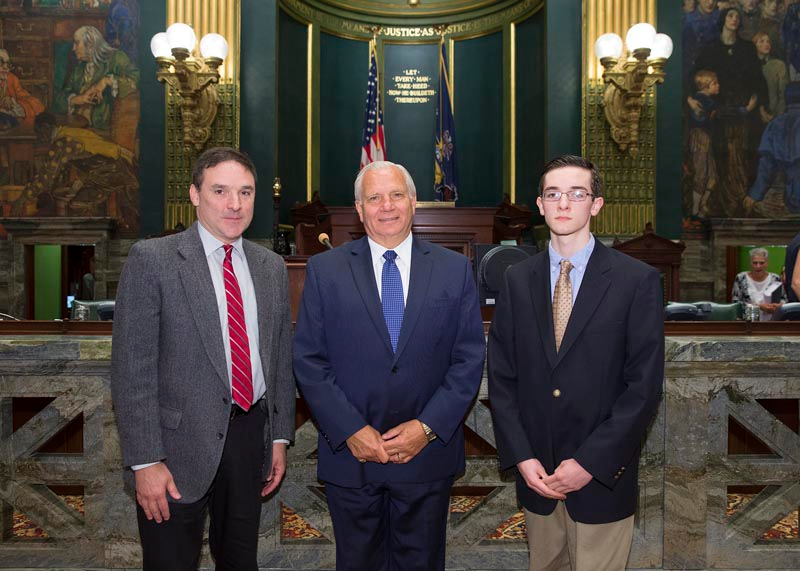 Senator Mensch and Representative Toepel welcomed the Brant family from Perkiomen Valley School District. 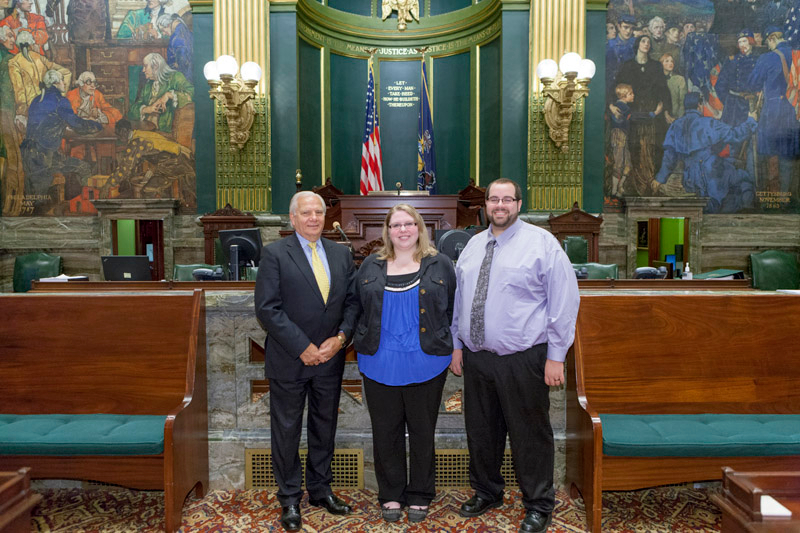 Senator Mensch and Representative Toepel discussed education funding in PA with the family. 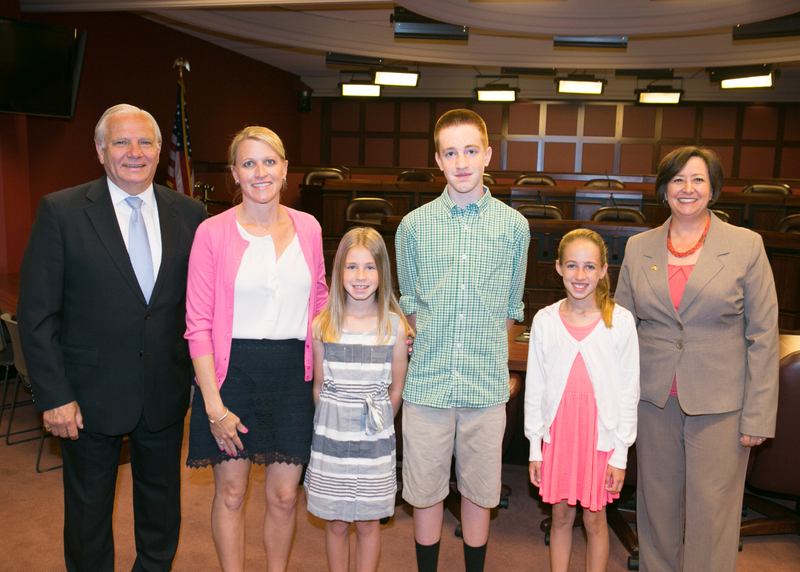 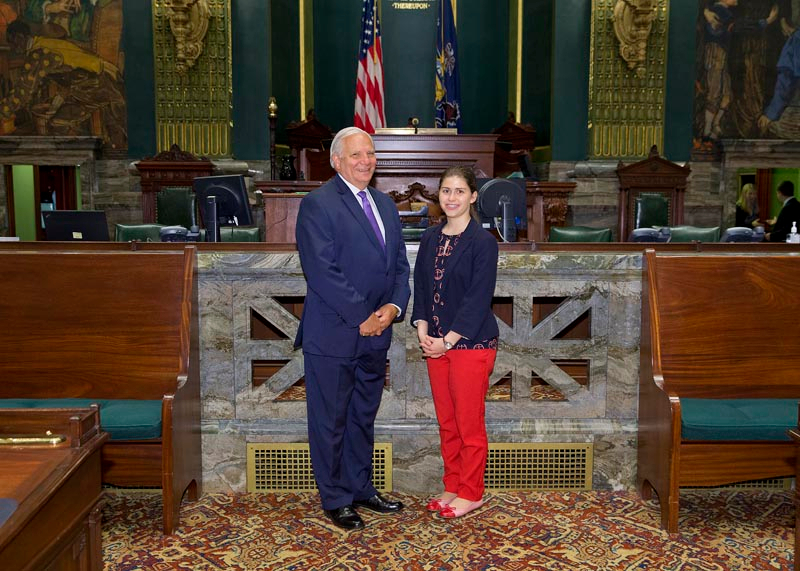 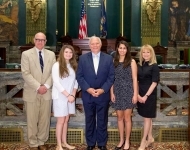 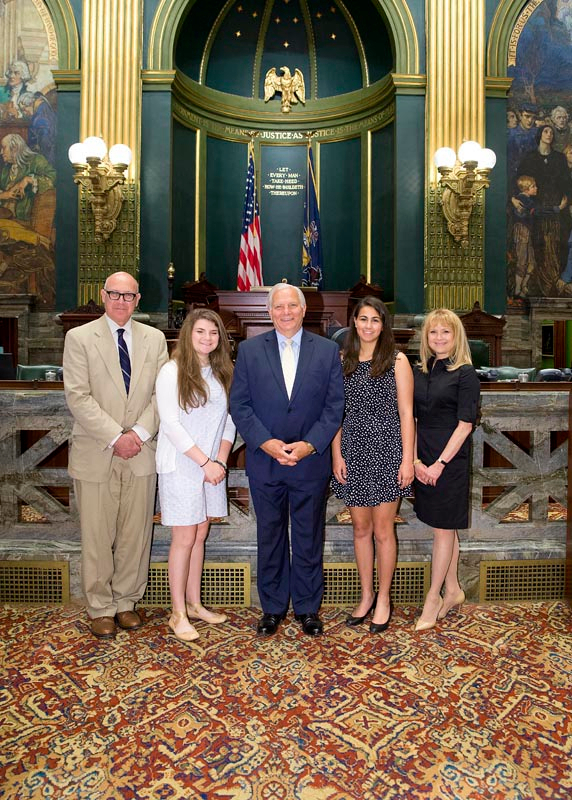 Senator Mensch welcomed former intern Danielle Marino and her family to Harrisburg! 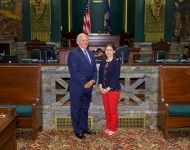 Danielle interned at Senator Mensch’s Pennsburg office and will be attending Arcadia University in the fall"_blank" title="Listen" href="http://av.pasenategop.com/Mensch/2014/0614/Mensch-061714-Intern.mp3"> Listen. 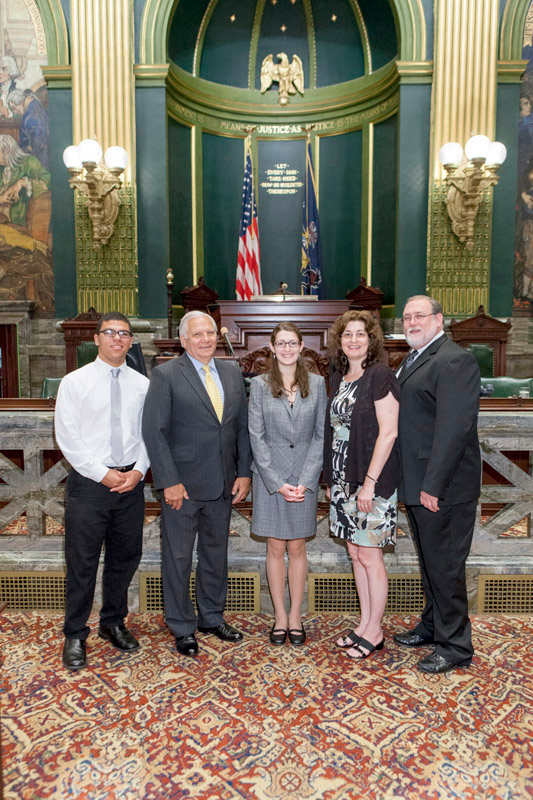 Pictured from L to R: Eriq Saldutti, Senator Mensch, Danielle Marino, Jill Marino, Joe Marino. 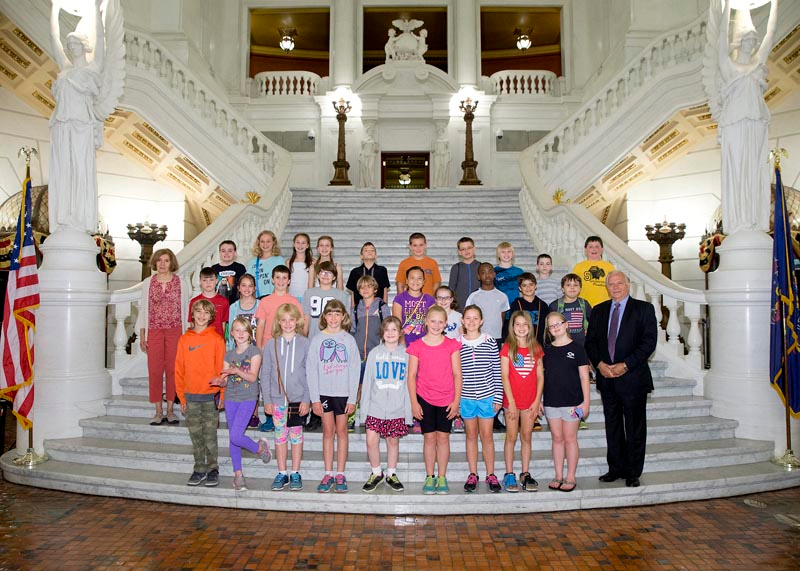 Senator Mensch met with 5th graders and staff from Springfield Elementary in Harrisburg. 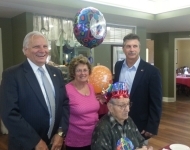 Senator Mensch wished celebrated Louise Hespell’s 102nd birthday with her. 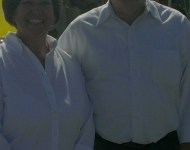 Louise is a constituent of the 24th district. 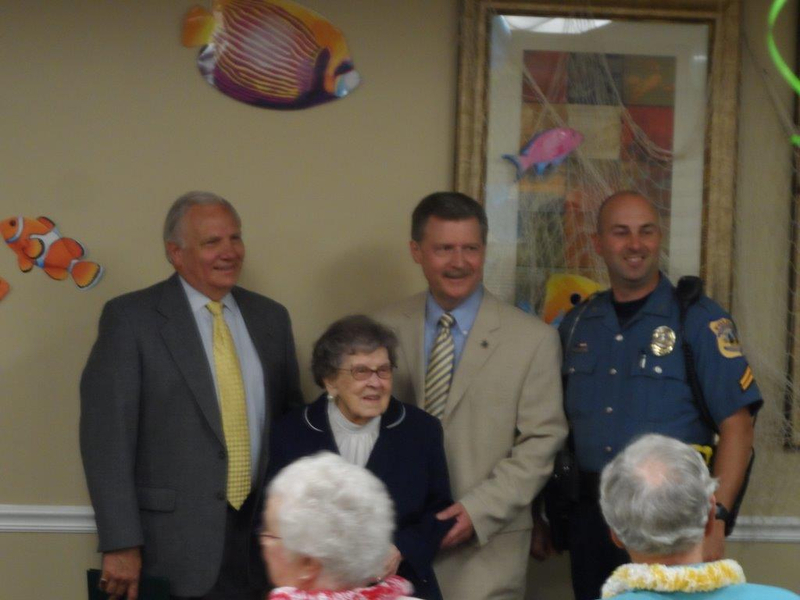 Pictured from L to R: Senator Mensch, Lousie Hespell, Lower Salford Police Chief Thomas Medwid and Corporal Chris Missimer. 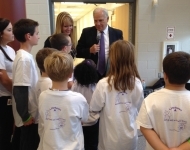 Senator Mensch participated in the St. Mary Catholic School Memorial Day Program with Representative Marcy Toepel. 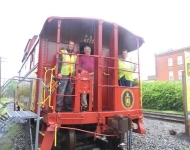 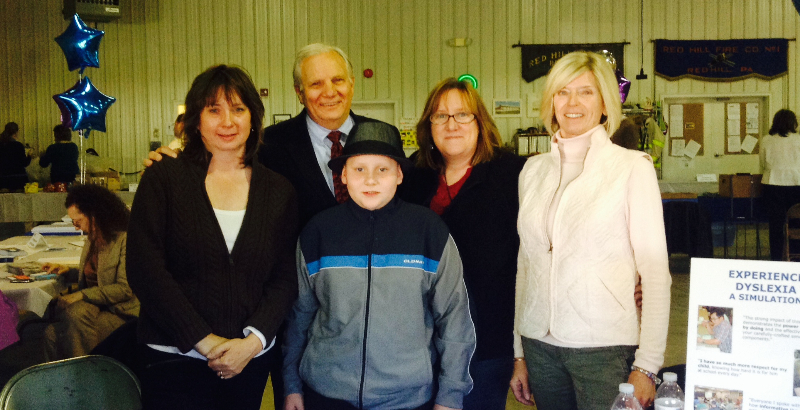 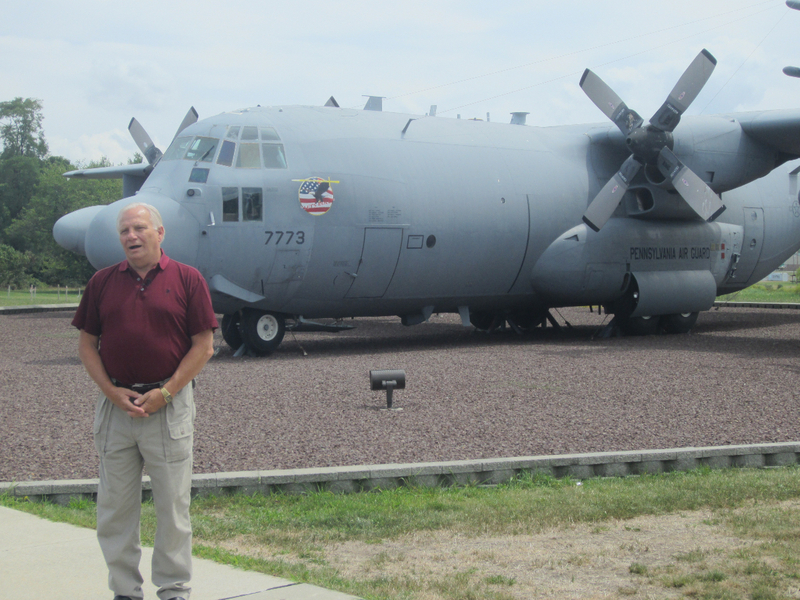 Senator Mensch joined the Colebrookdale Railroad Tour and toured various parts of the new 24th Senatorial District. 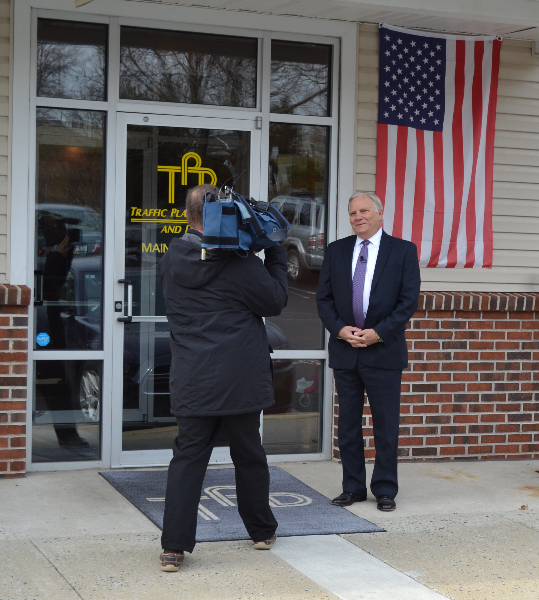 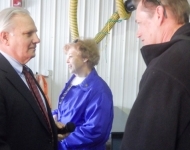 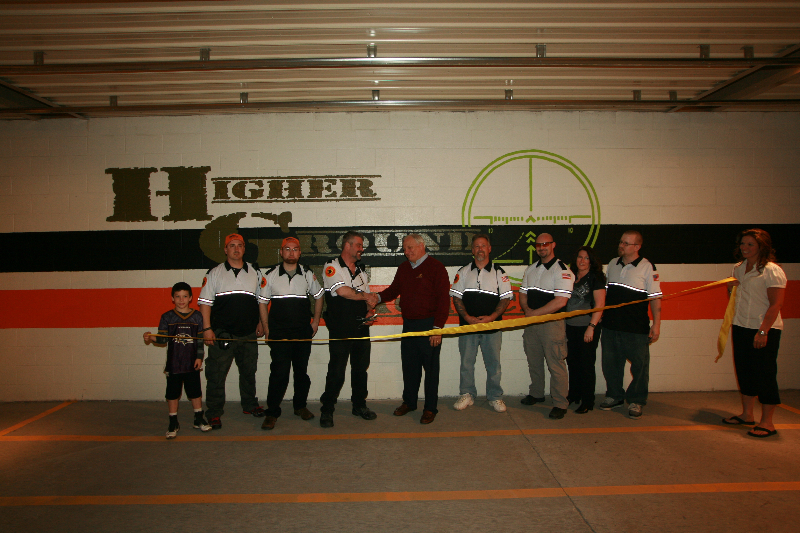 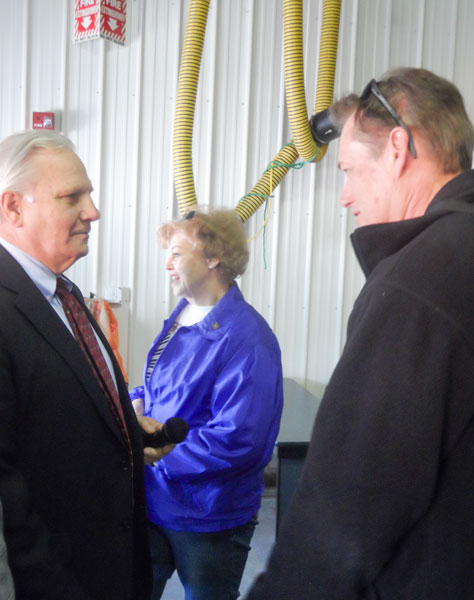 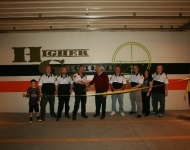 Senator Mensch attended the ribbon cutting for Higher Ground Tactical. 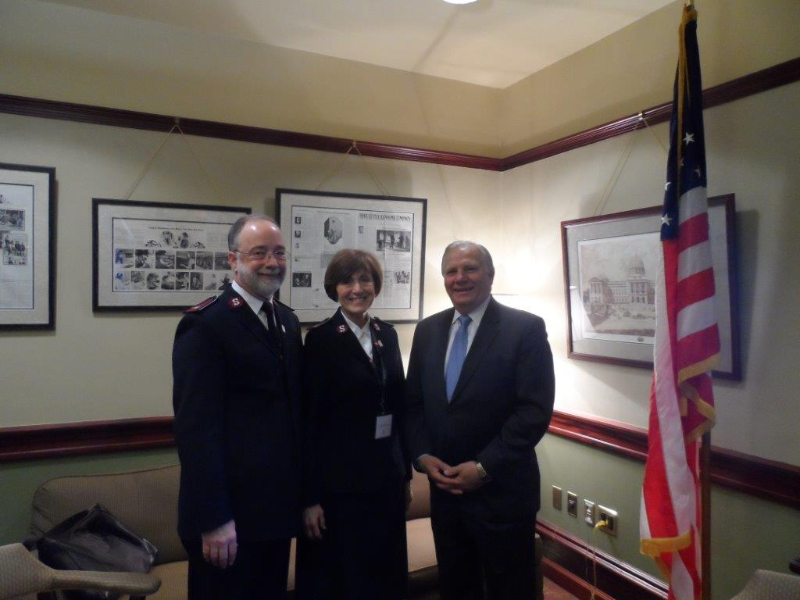 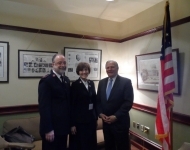 Senator Mensch met Colonel Donald Lance and Colonel Renee Lance, Divisional Commanders of the Eastern Pennsylvania Salvation Army. 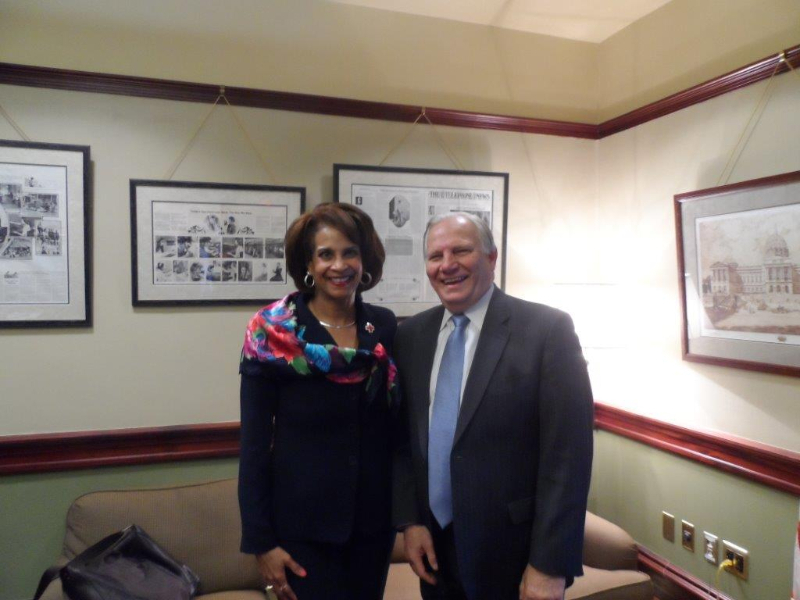 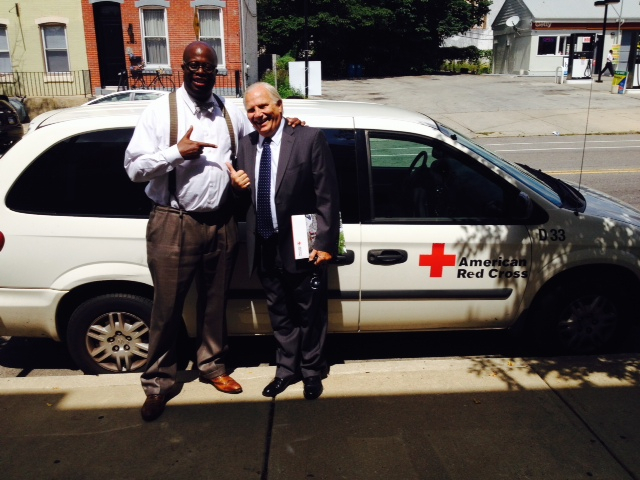 Senator Mensch met with Judge Renee Hughes, CEO of the SouthEast Region of Red Cross. 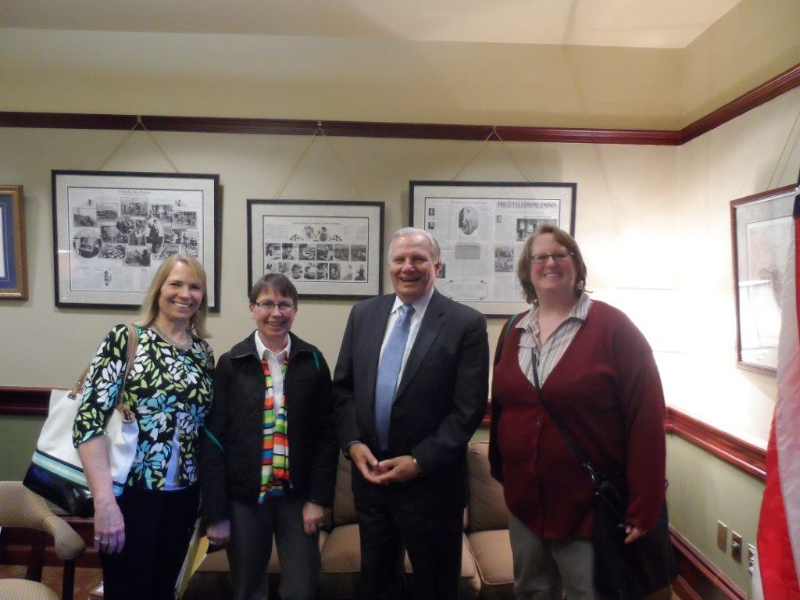 Members of the Bucks County Women’s Advocacy Coalition discussed state legislation with Senator Mensch during their Advocacy day. 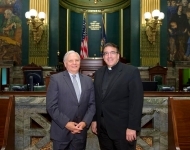 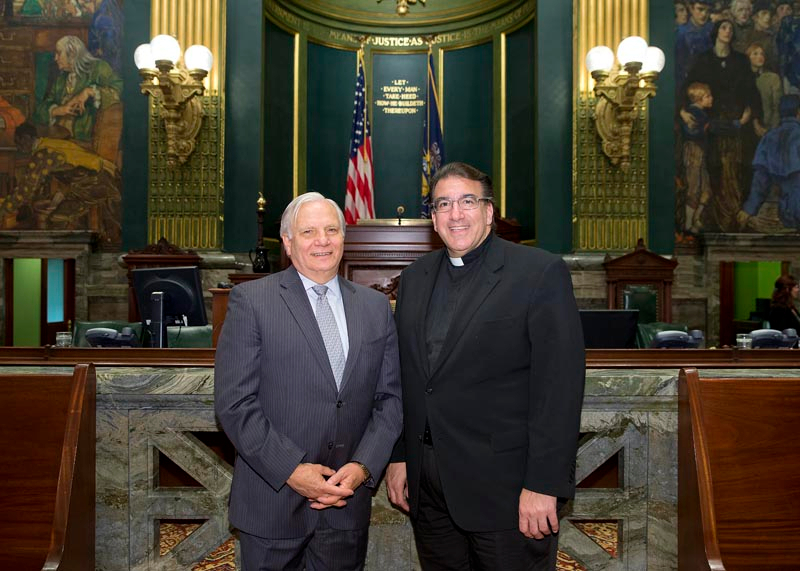 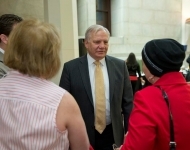 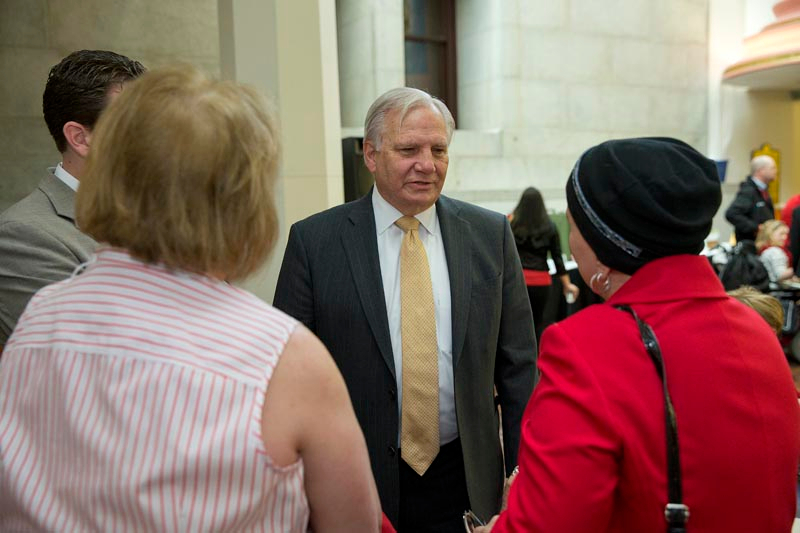 Senator Mensch welcomed guests of Guest Chaplain Father Bellopede to the Senate on 4/28/14. 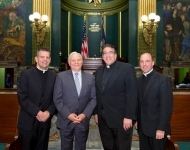 From left to right: Father Neil Sullivan, Senator Mensch, Father Bellopede, and Father Gerald Carey. 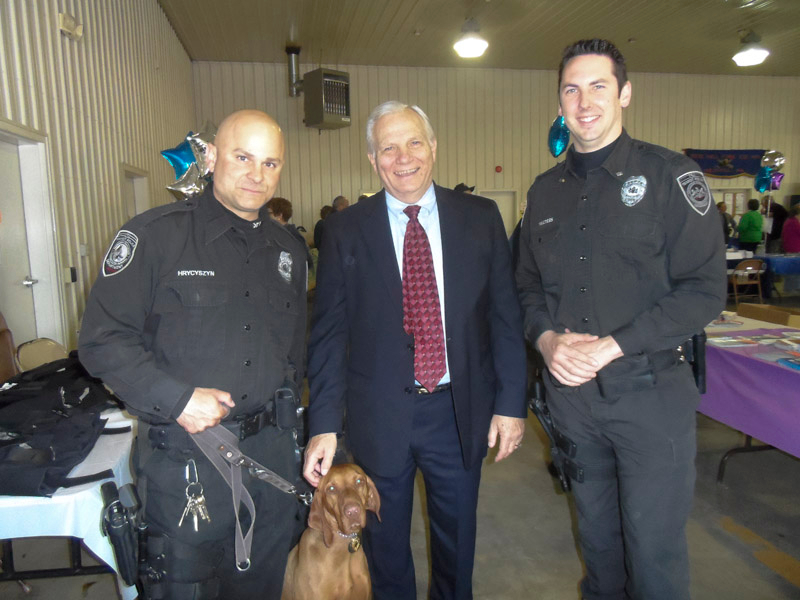 Senator Mensch welcomed the SEPTA Transit Police K-9 Unit to his 2014 Constituent Expo. 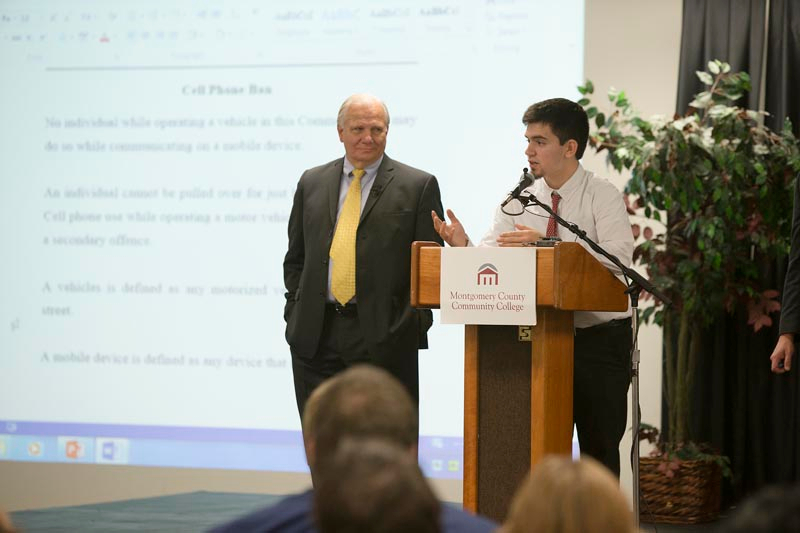 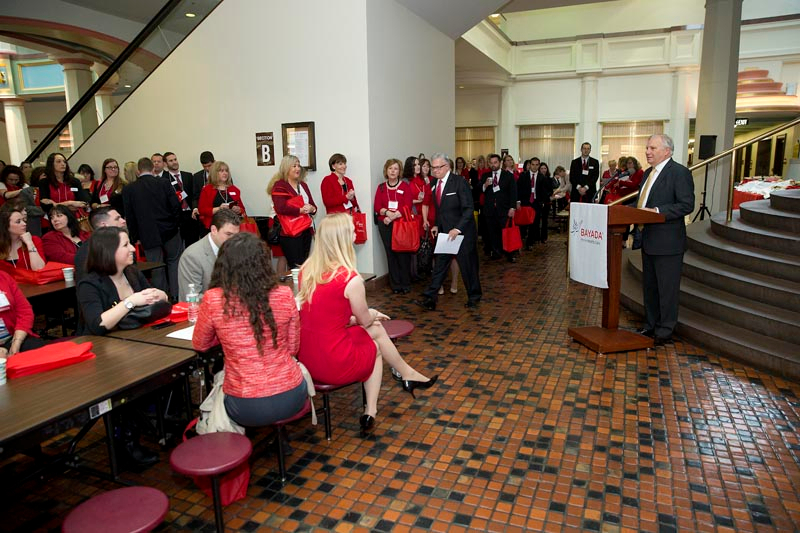 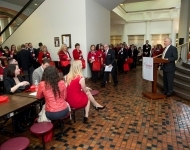 Senator Mensch greeted constituents during his 2014 Constituent Expo. 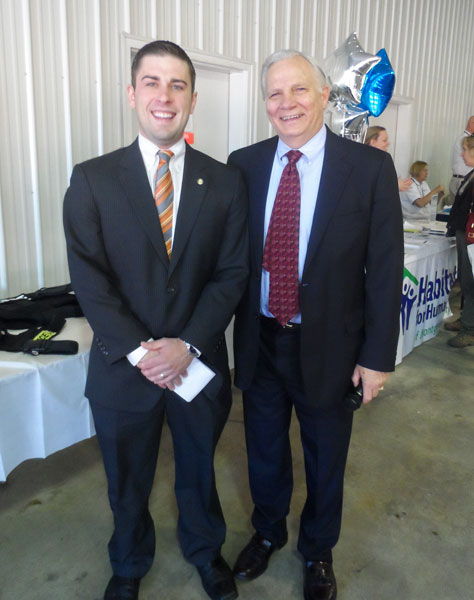 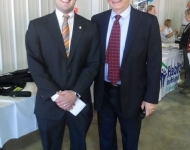 Senator Mensch and Representative Simmons greeted constituents and exhibitors during Senator Mensch's 2014 Constituent Expo. 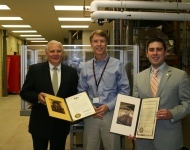 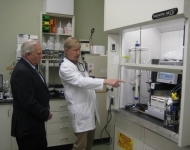 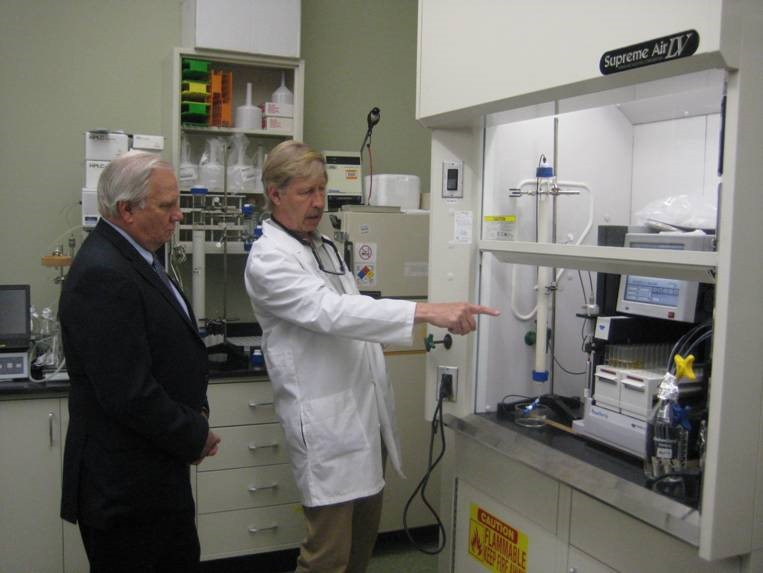 Dr. Mike Goetz (right) showed Senator Mensch items at the Baruch S Blumberg Institute's Natural Products Collection Laboratory. 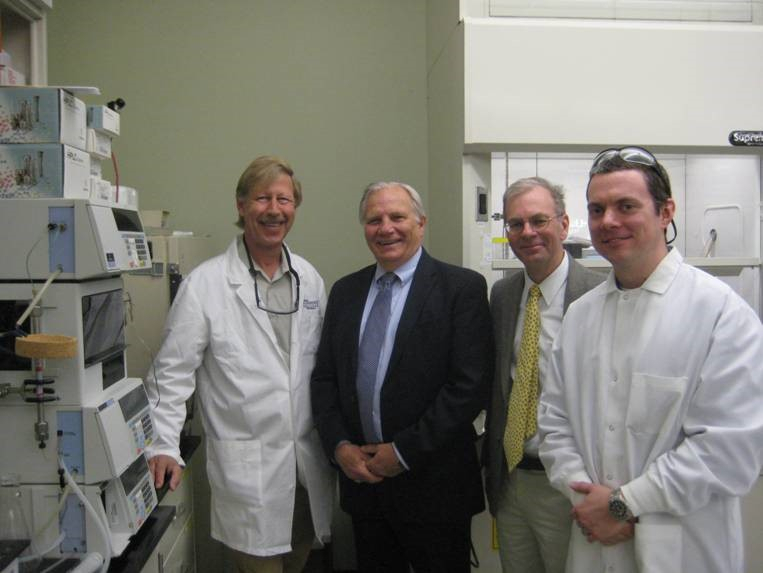 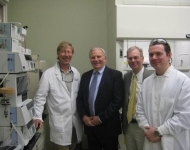 Senator Mensch posed with Dr. Mike Goetz (left), Dr. Timothy Block (3rd from left) and Dr. Jason Clement (far right) at the Baruch S Blumberg Institute's Natural Products Collection Laboratory. 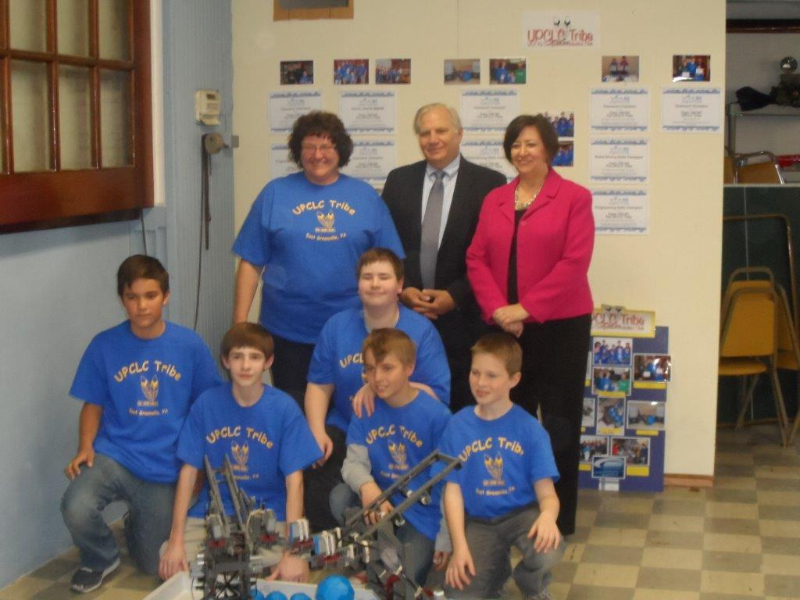 Senator Mensch and Representative Toepel enjoyed meeting the Community Life Center’s VEX IQ Robotics Team! 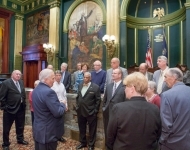 State Senator Mensch and PA Senator Pat Toomey joined members of the Indian Valley Chamber of Commerce during their tour and visit at Pennsylvania's capitol building. 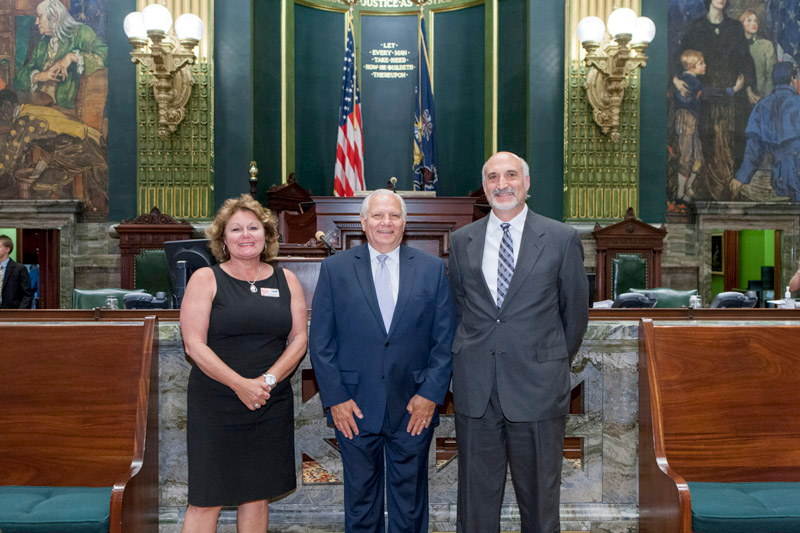 The National Hemophilia Foundation presented Senator Mensch with an award for his leadership on bringing awareness to Hemophilia patients in PA. 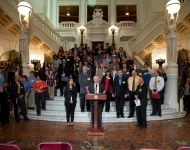 Senator Mensch presented Senate Resolution 327 designating April 2014 as Hemophilia Awareness month during the Hemophilia Awareness Day ceremony. 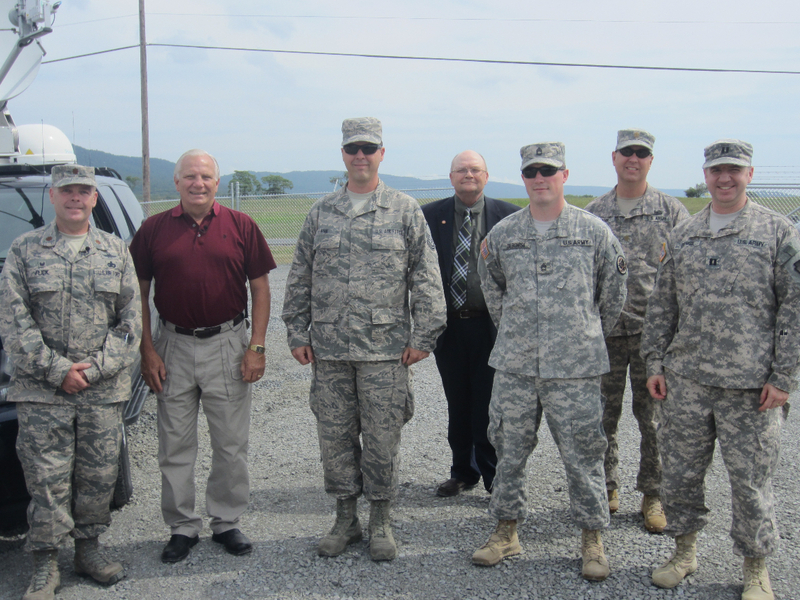 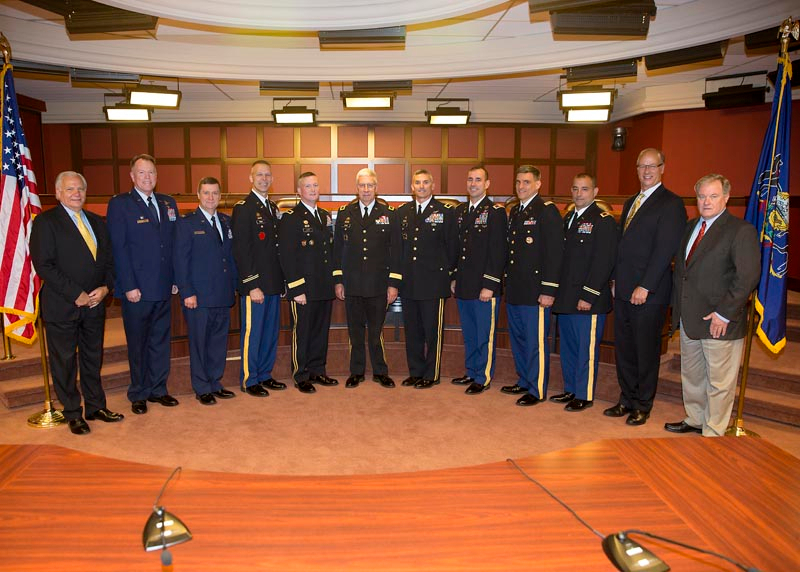 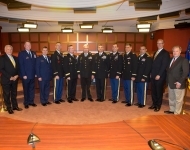 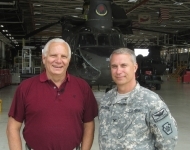 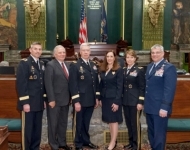 I had the honor of hosting the Adjutant General of Pennsylvania, Maj. General Wesley Craig. 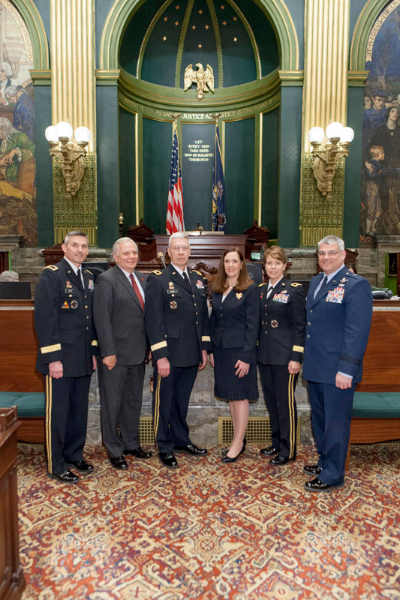 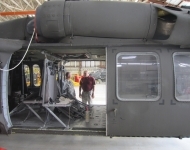 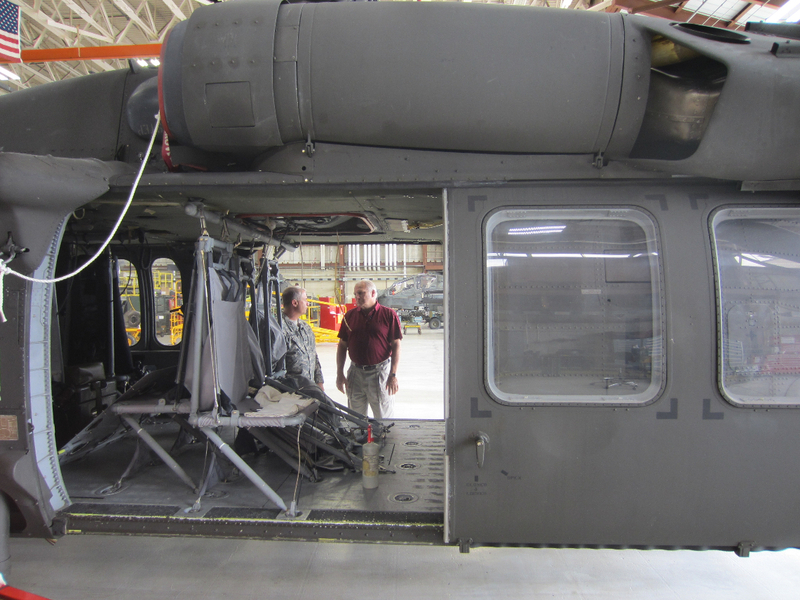 Major General Craig personifies the heart of the Pennsylvania National Guard and its dual mission to protect freedom and save lives both here and abroad. 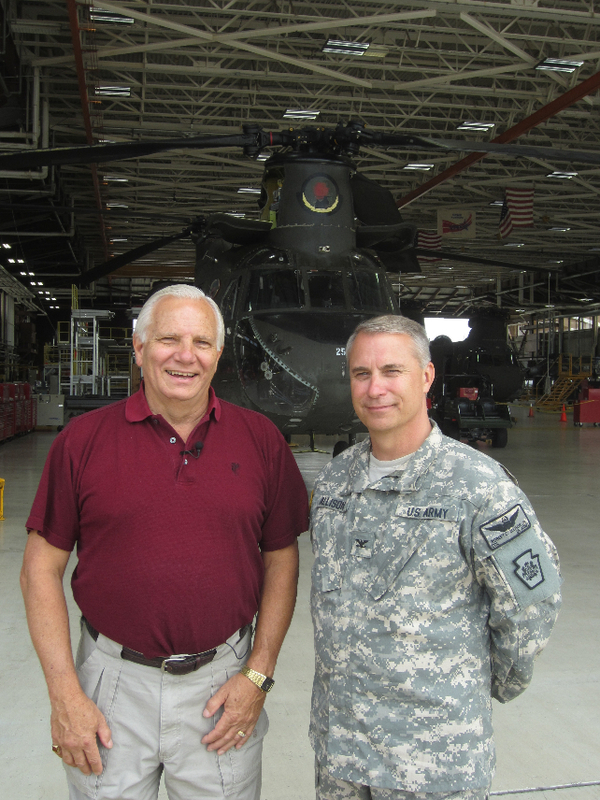 Like the 19,000 citizen-soldiers he leads, General Craig is highly trained and always prepared for any crisis or challenge. 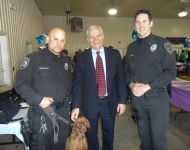 He exhibits enormous calm under pressure and he can be both a peacekeeper and a fighter as the need arises. 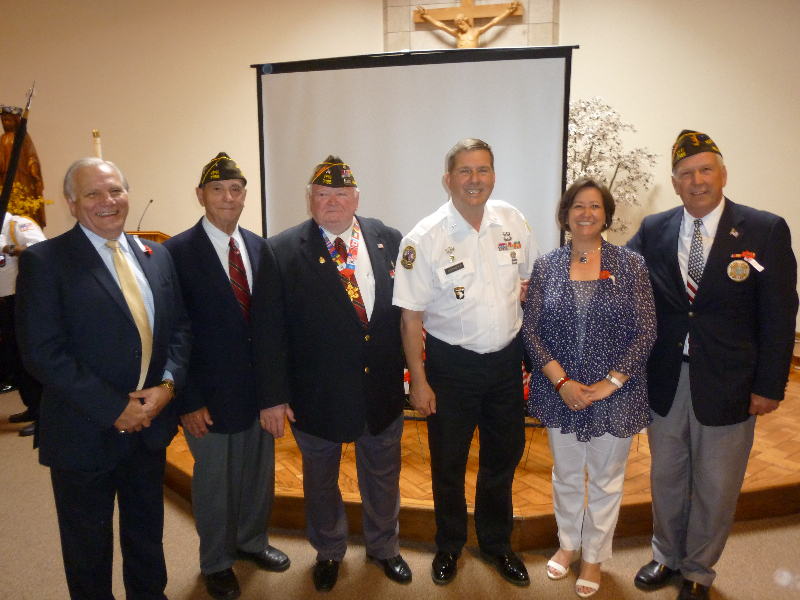 General Craig was also joined by BG Timothy Hilty, BG Carol Eggert and Brig Gen Tony Carrelli. 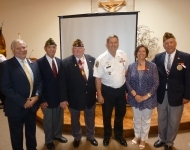 (From left to right) BG Timothy Hilty, Senator Bob Mensch, Gen. Craig, Senator Lisa Baker, BG Carol Eggert, Brig Gen Tony Carrelli. 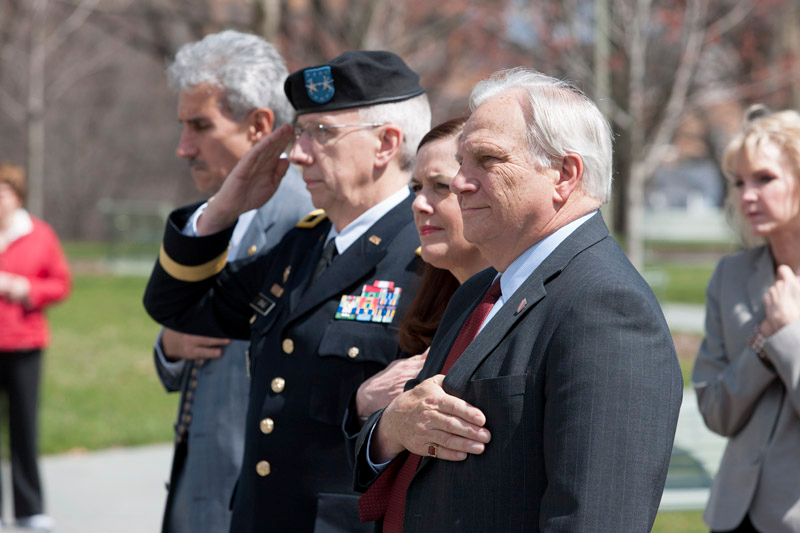 Senator Mensch, Chair of the Veterans Affairs and Emergency Preparedness Committee, stood alongside Senator Baker and National Guard officials to honor former Governor and Medal of Honor recipient John F. Hartranft. 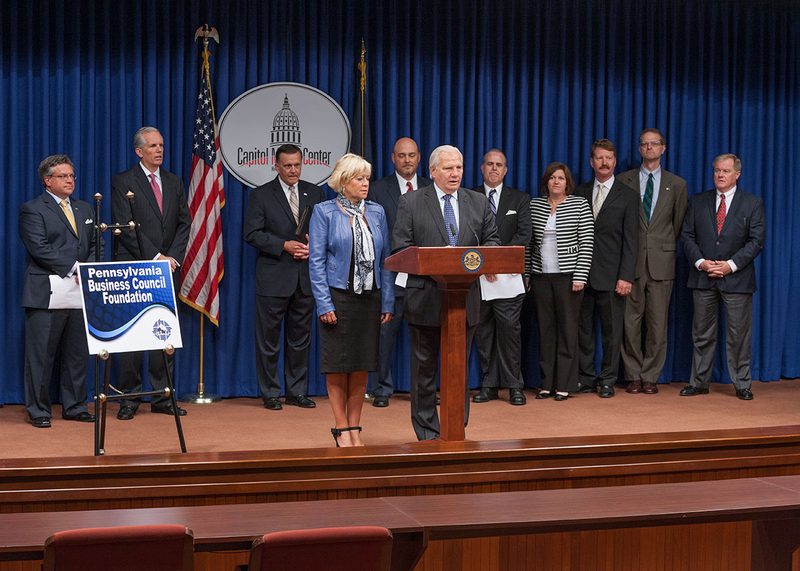 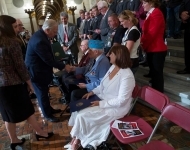 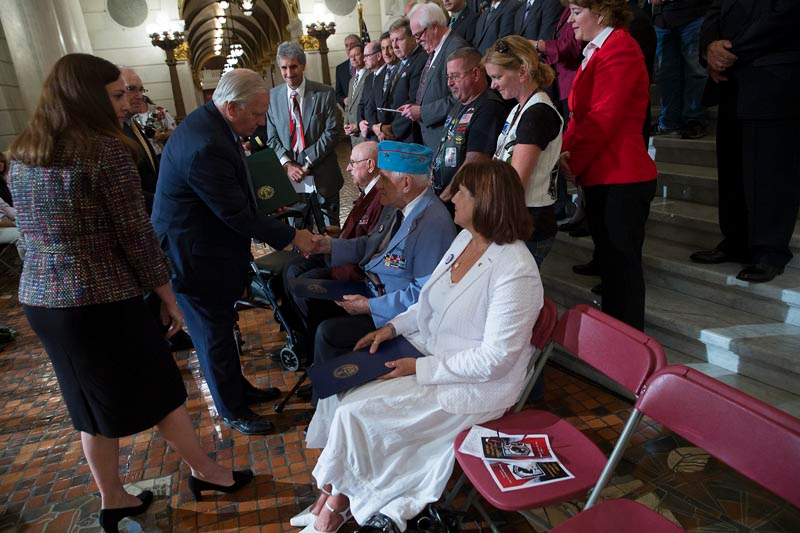 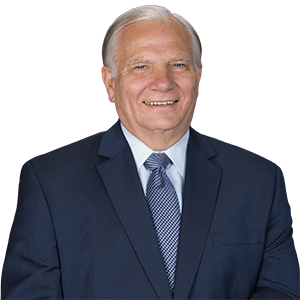 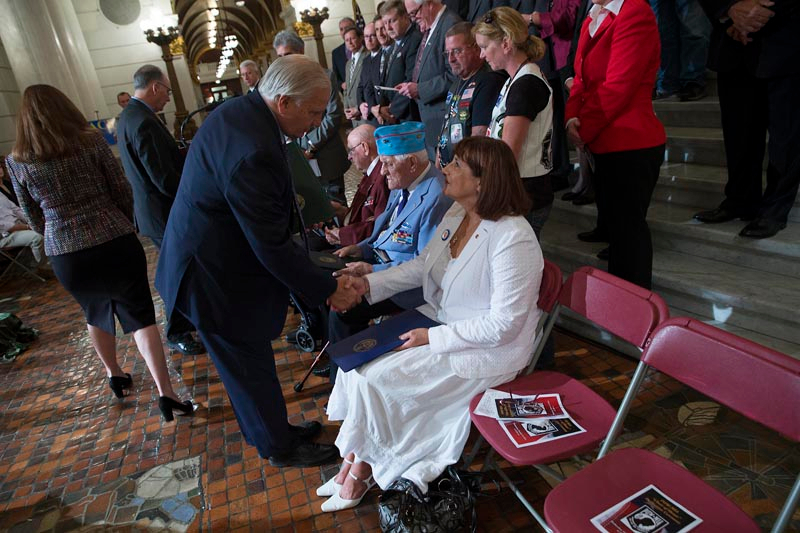 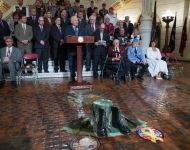 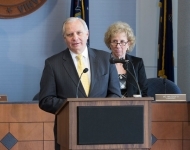 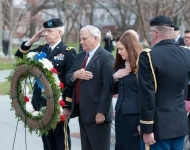 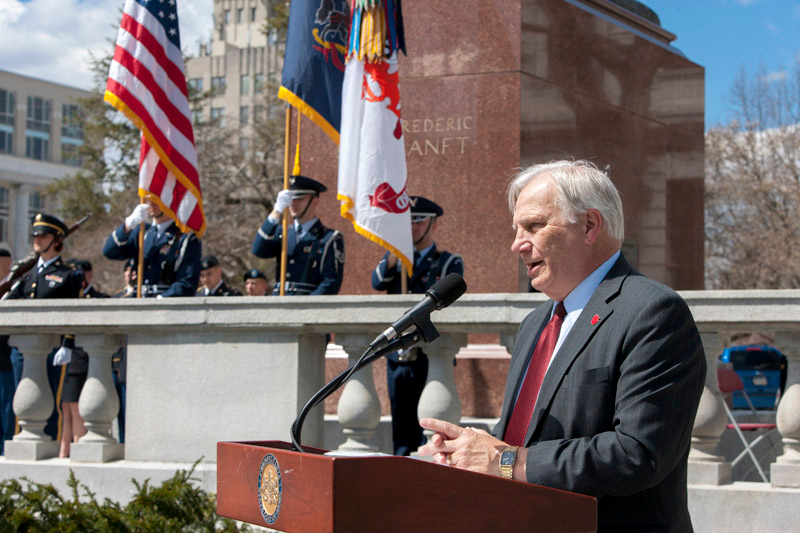 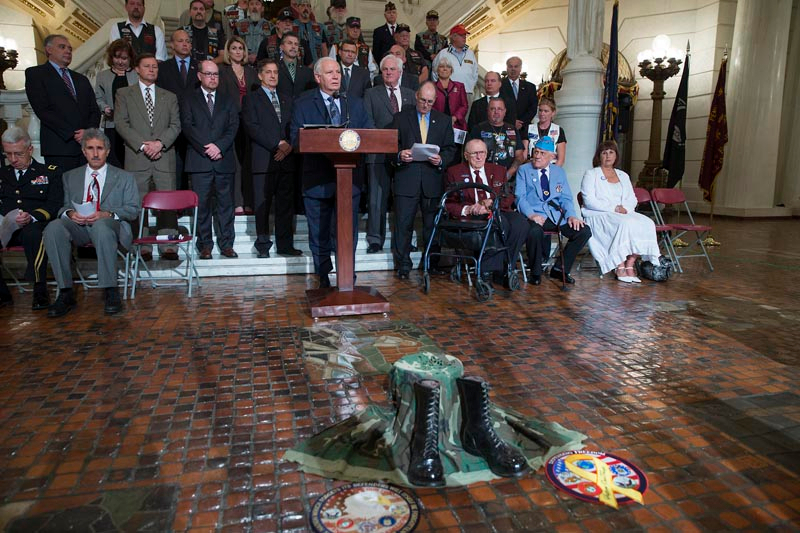 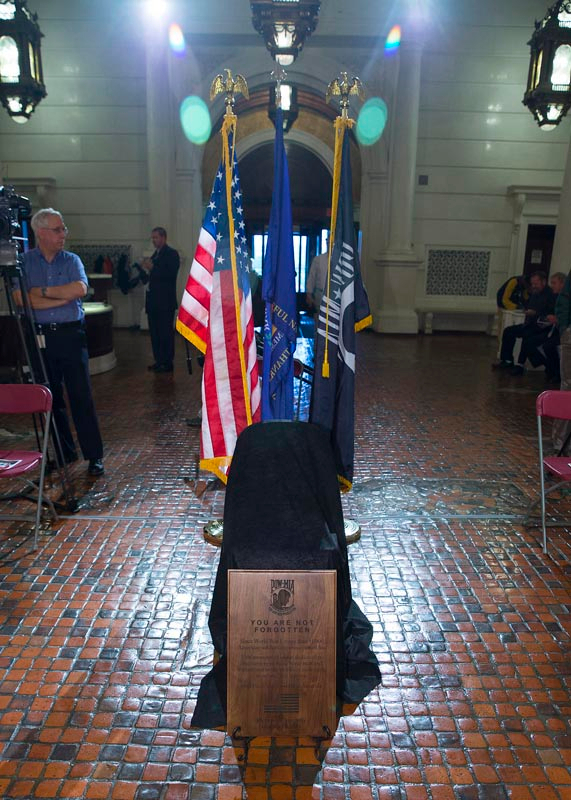 Senator Mensch, Chair of the Veterans Affairs and Emergency Preparedness Committee, gave remarks at the PA National Guard Wreath Laying Ceremony on April 9, 2014 to Commemorate former Governor and Medal of Honor recipient John F. Hartranft. 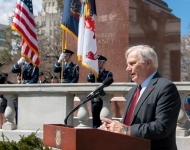 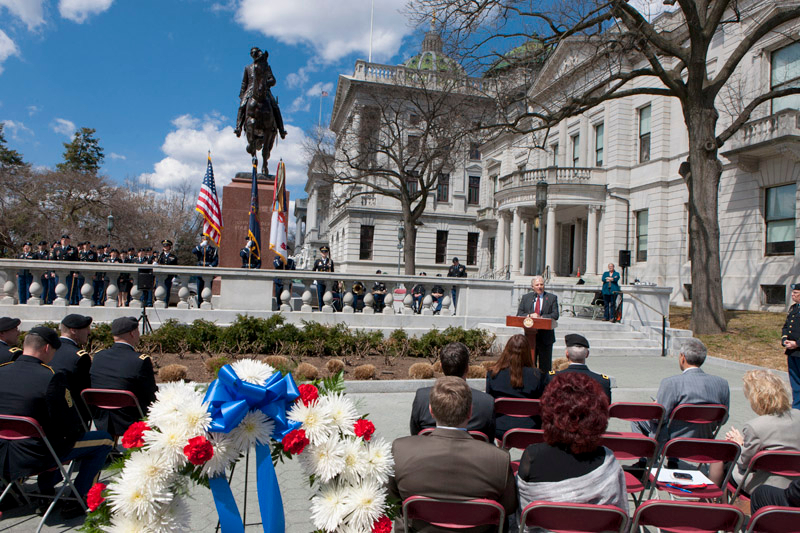 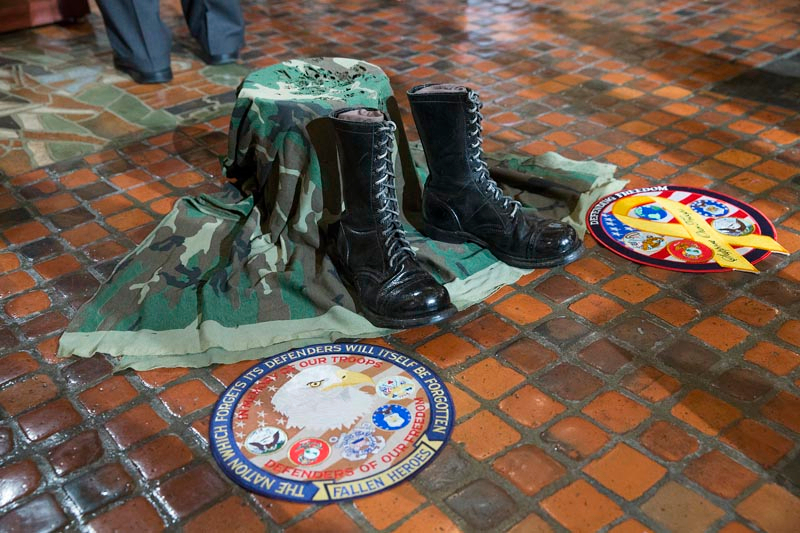 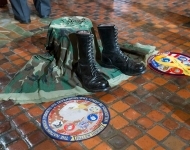 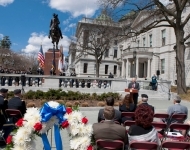 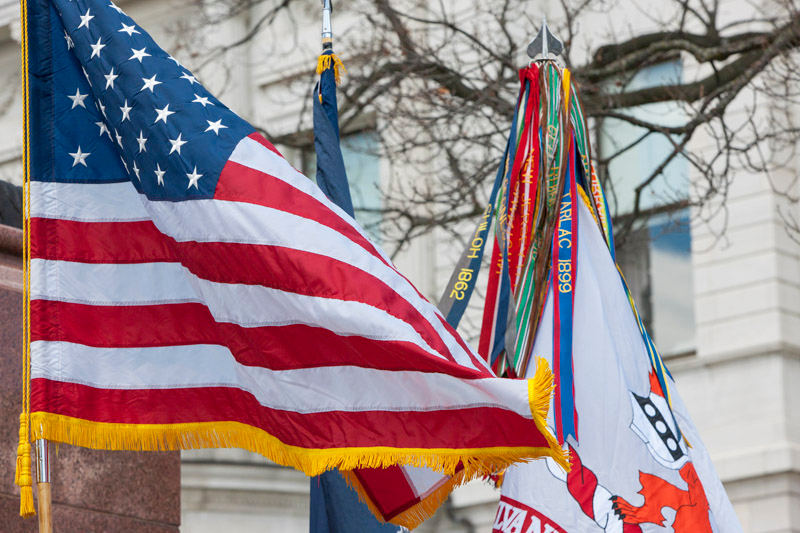 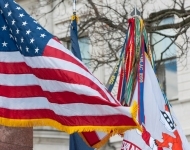 The colors were presented at the PA National Guard Wreath Laying Ceremony on April 9, 2014 to commemorate former Governor and Medal of Honor recipient John F. Hartranft. 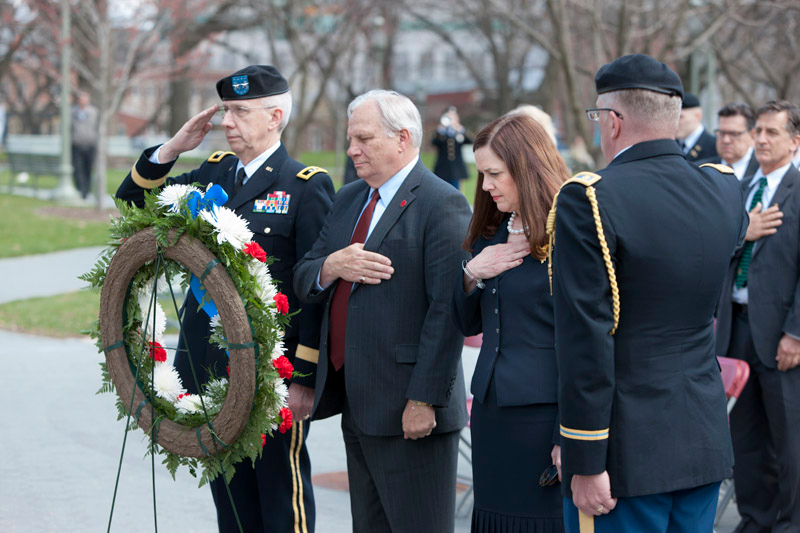 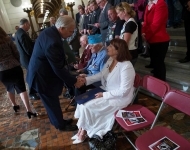 Senator Mensch and Senator Baker paused for a moment of silence during the PA National Guard Wreath Laying Ceremony on April 9, 2014 to commemorate former Governor and Medal of Honor recipient John F. Hartranft. 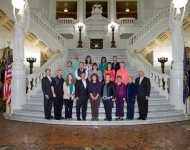 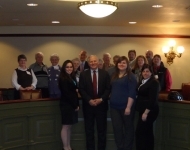 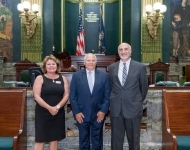 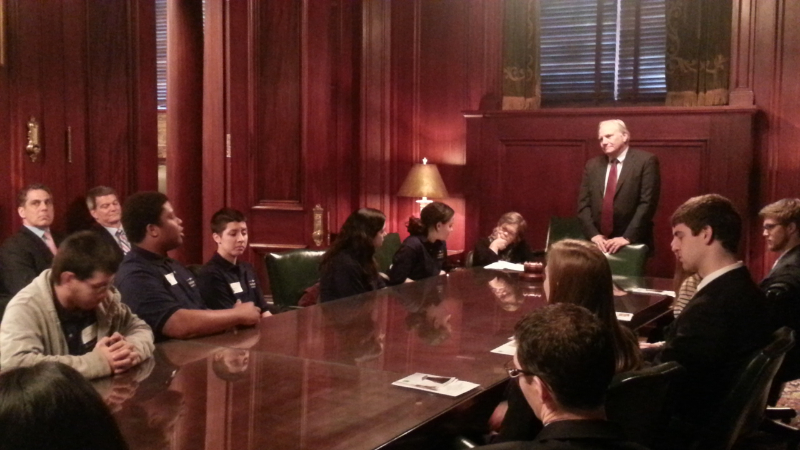 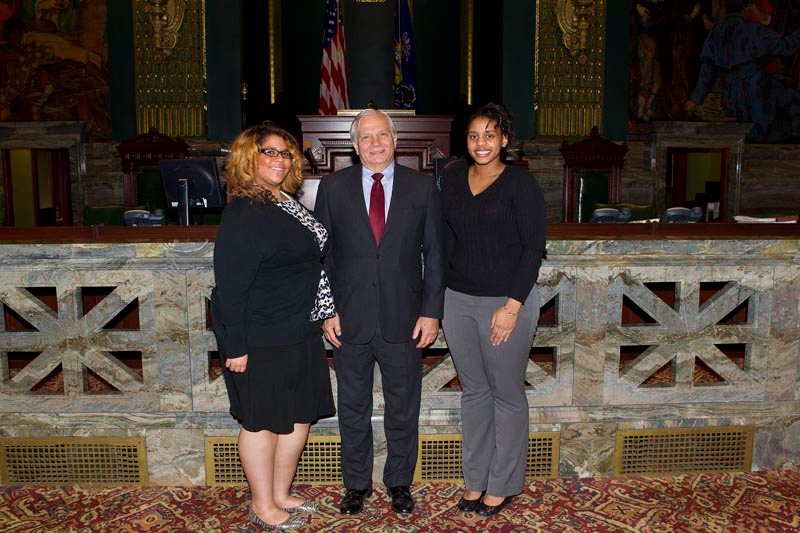 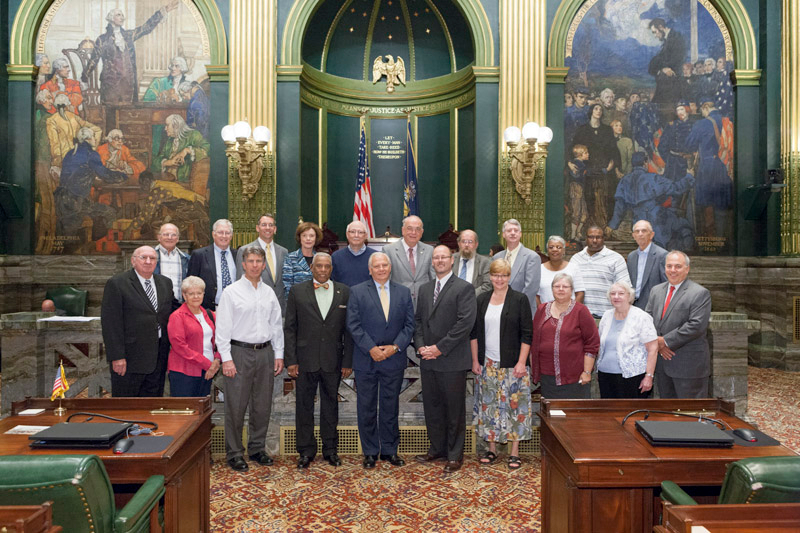 Senator Mensch welcomed students from Lycoming College during their visit to Harrisburg. 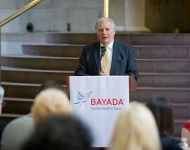 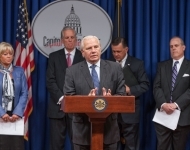 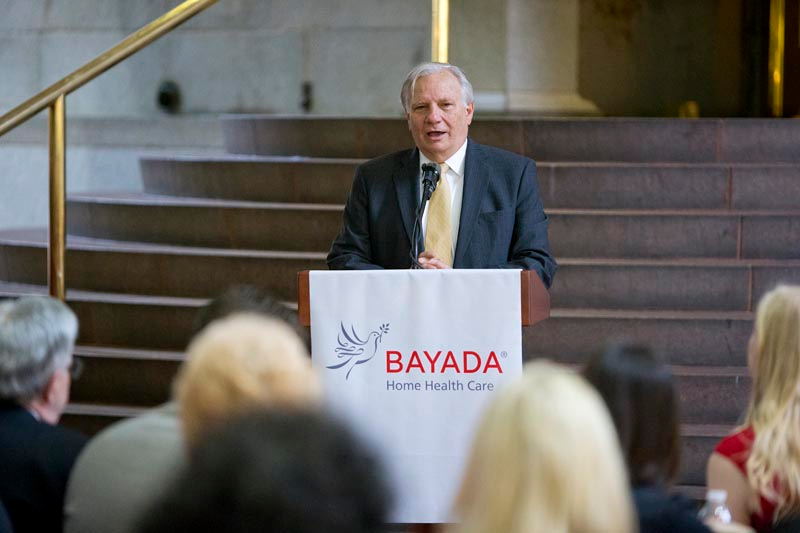 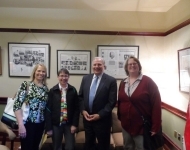 Senator Mensch discussed the importance of the PA long term care commission, BAYADA Nurses, Therapists, Home Health Aides, and Medical Social Workers that provide quality care to people of every age and stage of life. 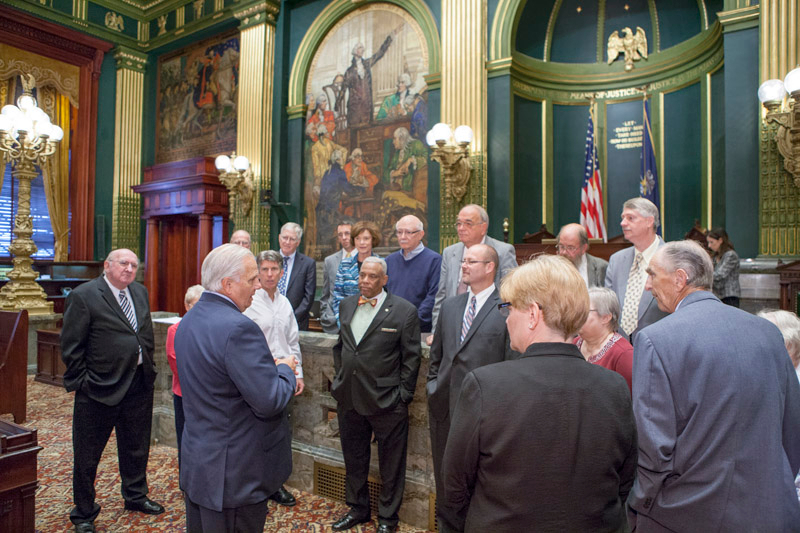 Senator Mensch met with roughly 22 different volunteer firefighters to discuss new ways to recruit and retain volunteer firefighters. 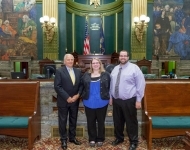 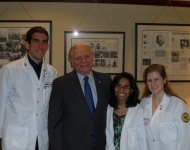 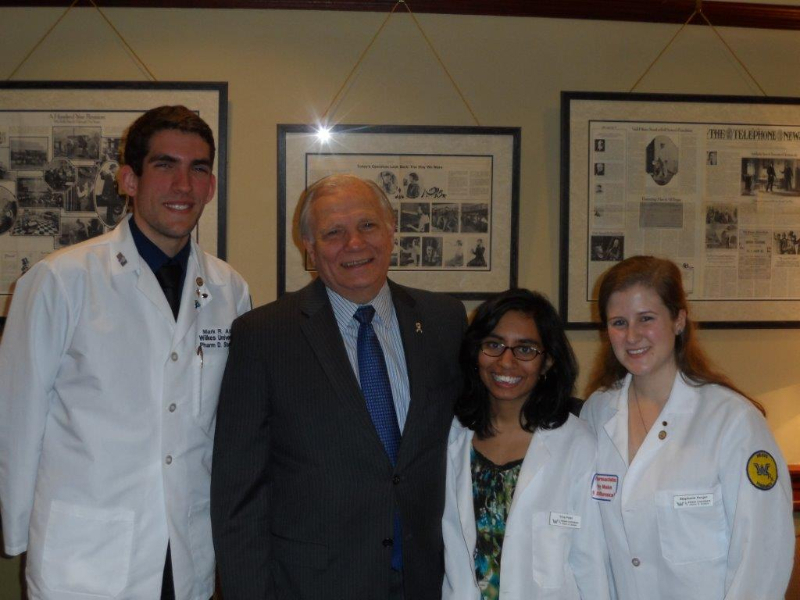 Senator Mensch met with pharmacy students from Wilkes University and discussed state legislation that will impact their profession. 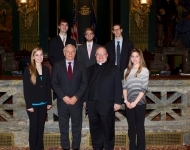 Senator Mensch met with Father Bernard O'Connor and students from DeSales University during their visit in Harrisburg. 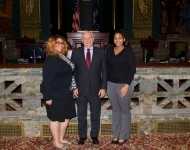 Senator Mensch welcomed Dr. Mark Erickson, President of Northampton Community College, and NCCC students during their visit to Harrisburg. 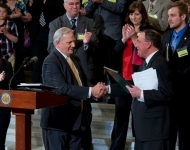 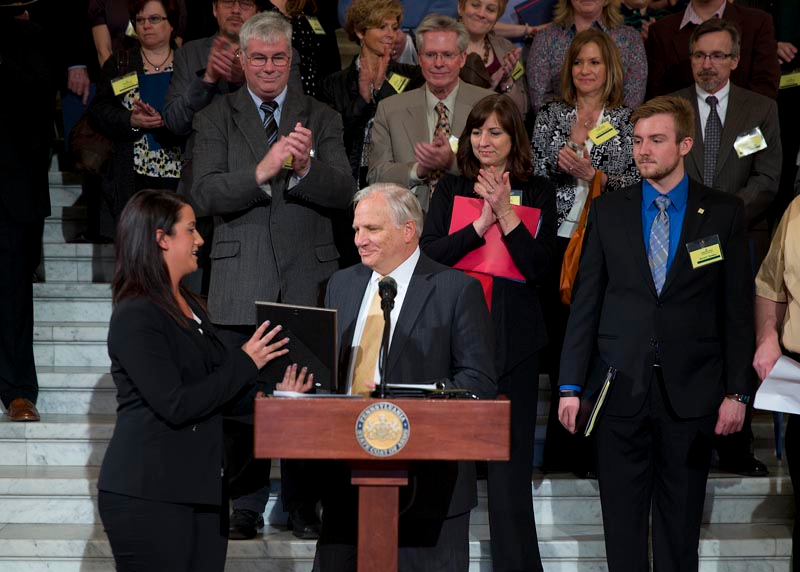 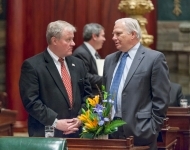 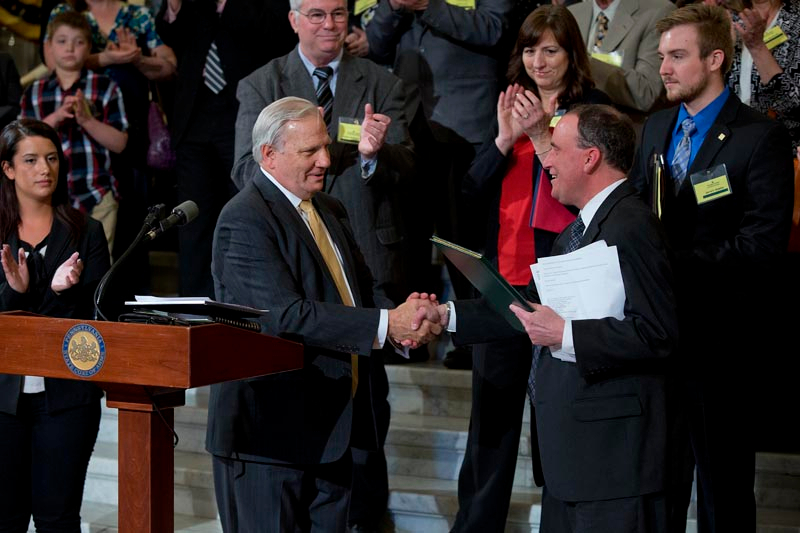 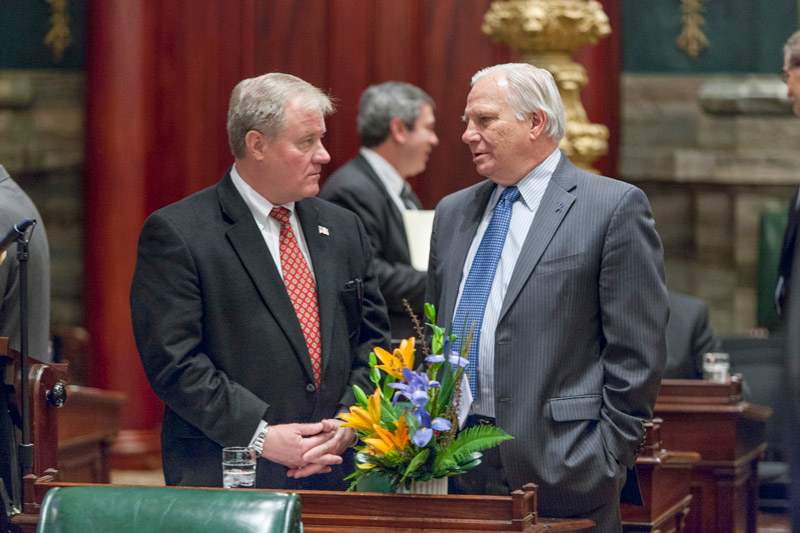 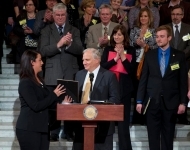 Senator Mensch welcomed Senator Scott Wagner to the Pennsylvania Senate after his swearing-in ceremony on April 2, 2014. 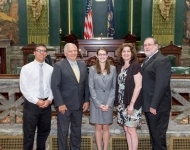 Senator Mensch had the opportunity to listen to students from DeSales University, Northampton Community College, and Lycoming College as they shared their thoughts on the PA Budget. 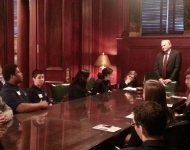 Senator Mensch met with members from the Berks County, Bucks County and Montgomery County Farm Bureaus and Delaware Valley College students to discuss state issues and the PA Budget. 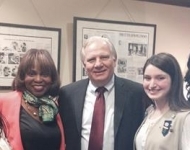 Senator Mensch met with Girl Scouts from the Girl Scout council of NEPA to discuss upgrading a girl scout camp in the 24th Senatorial District. 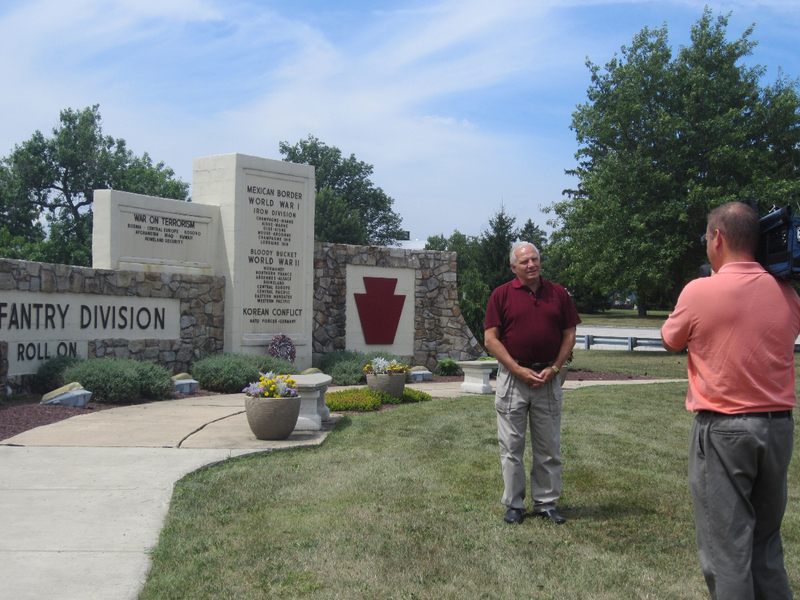 Senator Mensch enjoyed filming more Mensch Reports at Traffic Planning and Design/Bursich Associates, Steel River Playhouse, and the Boyertown Museum of Automobiles. 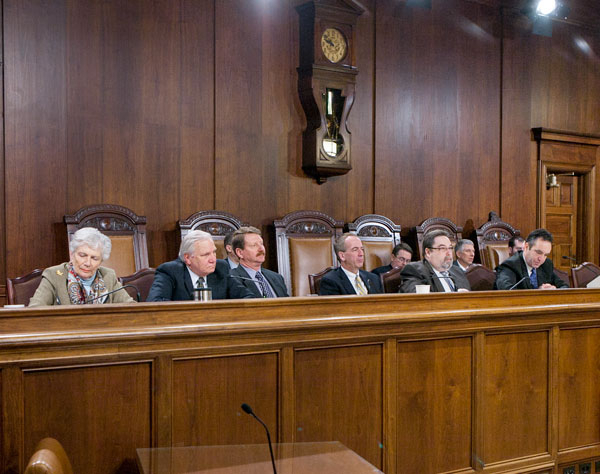 Keep an eye out for these tapings by visiting http://3dev-pa-senate-gop.pantheonsite.io/mensch/audiovideo/. 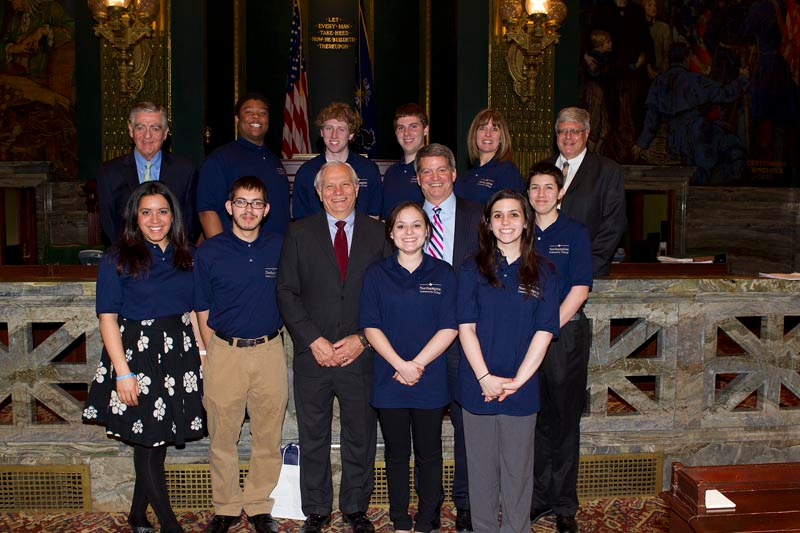 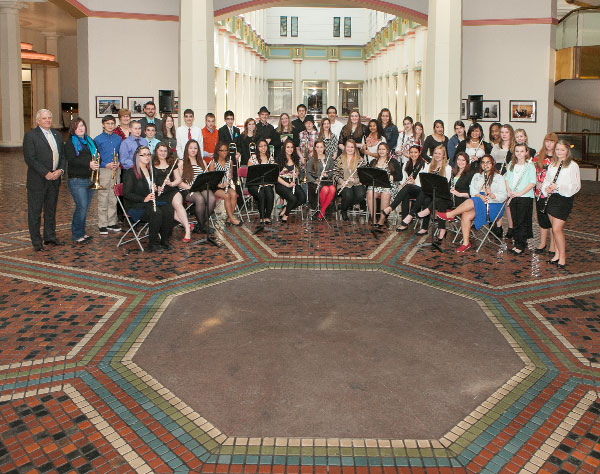 Senator Mensch met students from Pottstown High school’s Woodwind/Brass Ensembles. 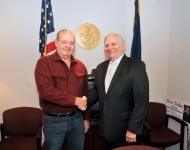 Senator Mensch's bill, SB 1046, was endorsed by the Governor. 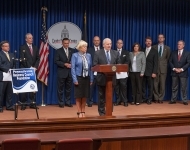 This bill will increase the cap. 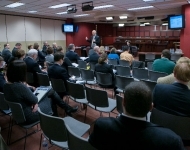 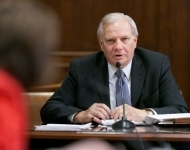 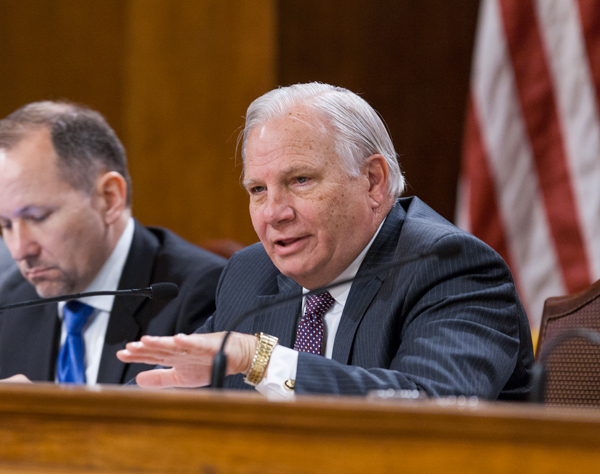 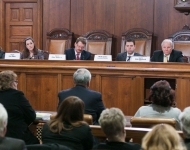 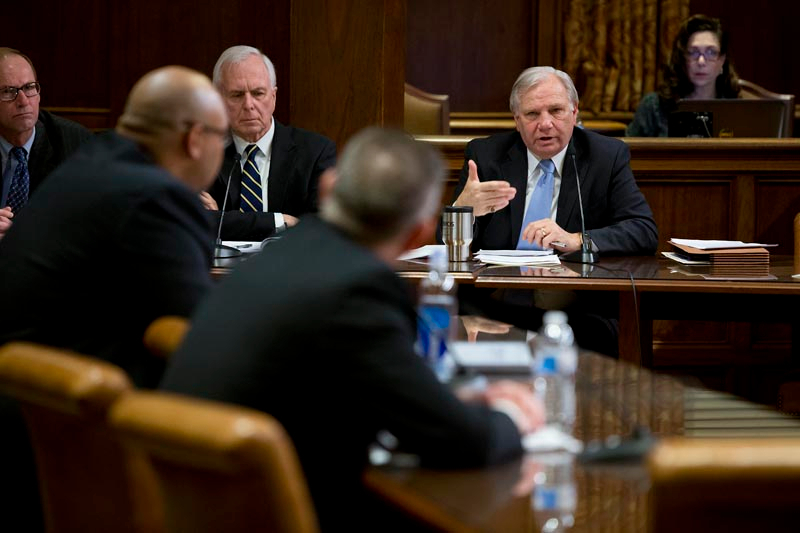 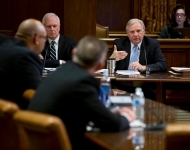 During the budget hearing for the Department of Public Welfare, Senator Mensch asked Secretary Mackereth if DPW was prepared to deal with changes established by passage of the Child Protection legislation package, reporting of elder abuse, the new Pennsylvania Long-Term Care Commission, and Child Advocacy Centers. 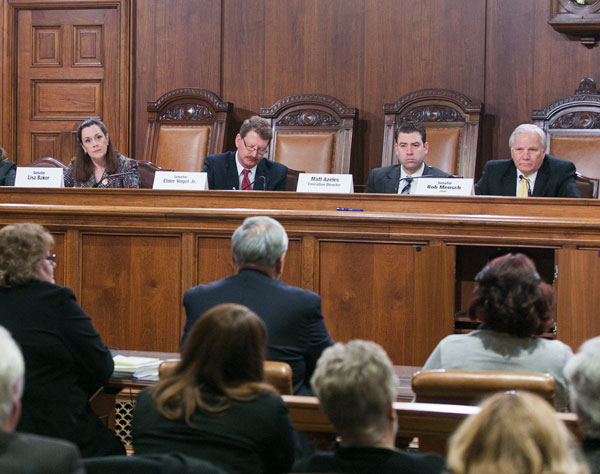 During the Senate Approps budget hearing for the Attorney General's Office, Attorney General Kane applauded his efforts to prevent child abuse and said the bills were well written and that she supported all of them. 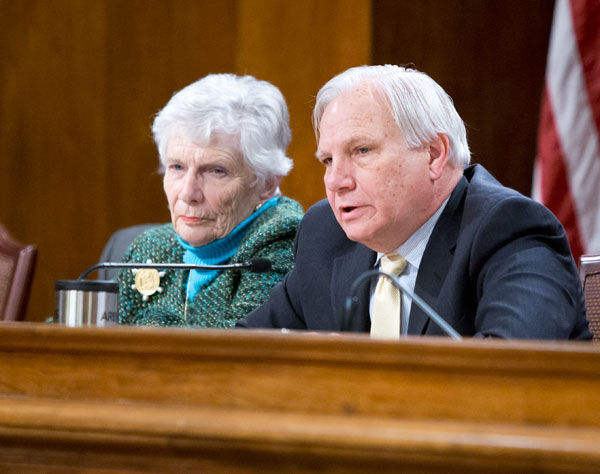 When asked by Senator Mensch if she thought it was important that to provide the same protections for older Pennsylvanians and she agreed that we need to provide the same protections to older Pennsylvanians as well. 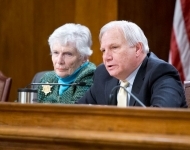 Senator Mensch asked Secretary Sheri Phillips several questions during a public hearing. 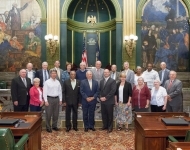 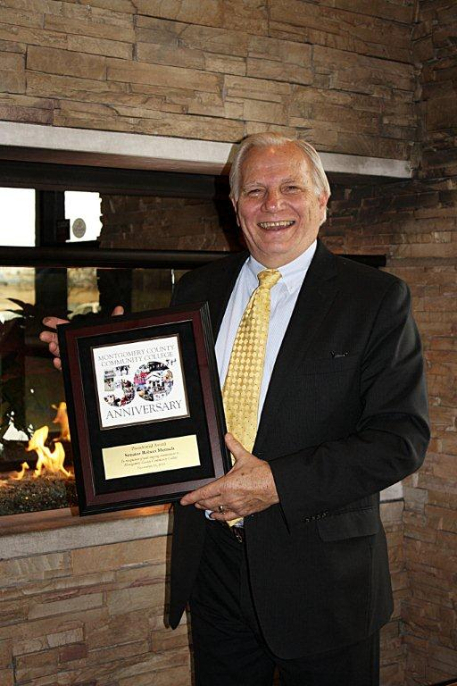 Congratulations to Stan Seitzinger, Manager of Upper Hanover Township, who was recognized by the International City and County Management Association (ICMA) for 35 years of service to local government. 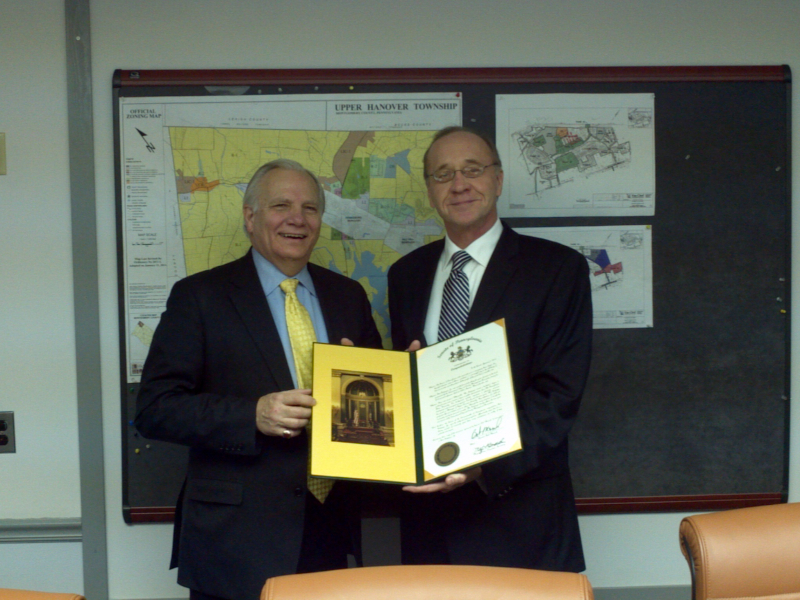 Senator Mensch was honored to present a citation to Mr. Seitzinger on behalf of his dedicated service to the local community. 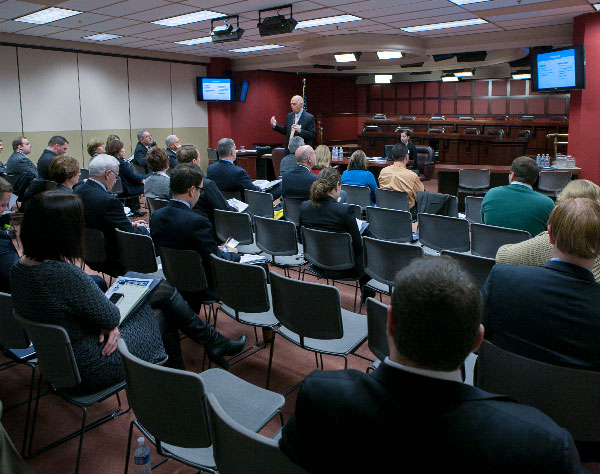 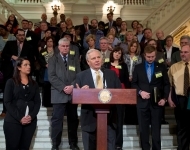 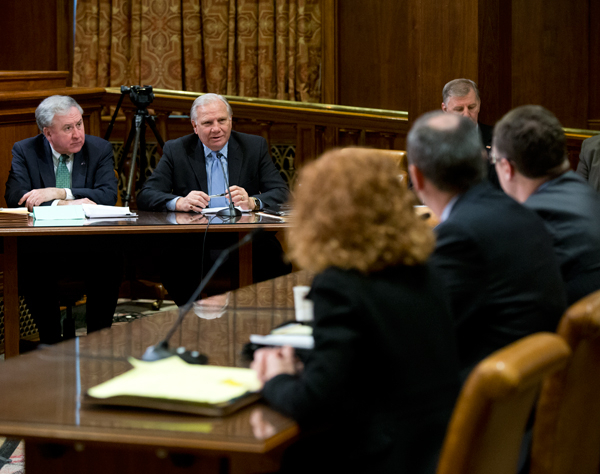 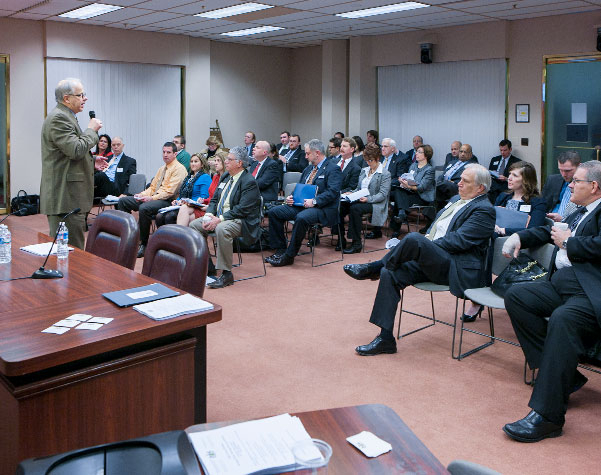 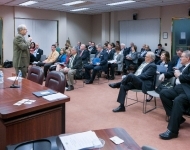 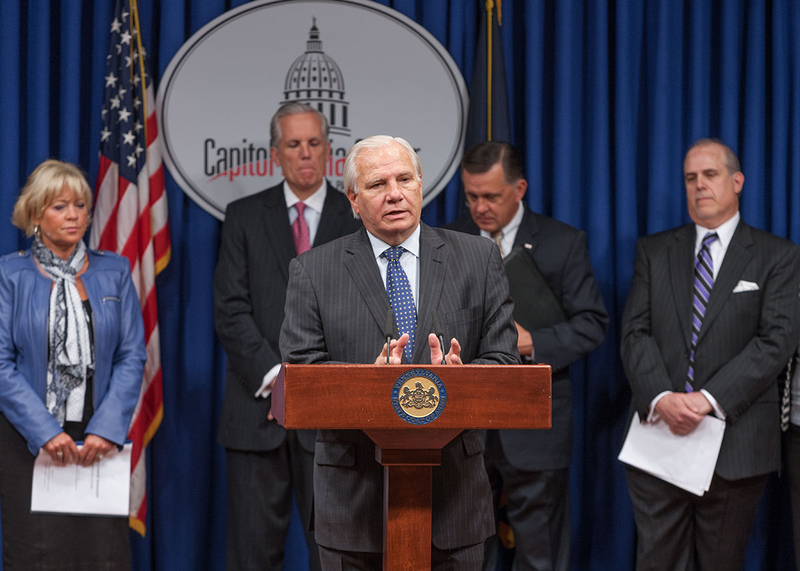 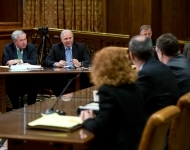 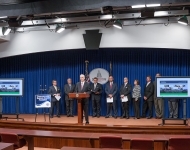 Tom Croft, Executive Director of SEWN and Steel Valley Authority, discussed SEWNS’s services with Senators and staff during the joint Economy, Business and Jobs Caucus and Manufacturing Caucus Meeting. 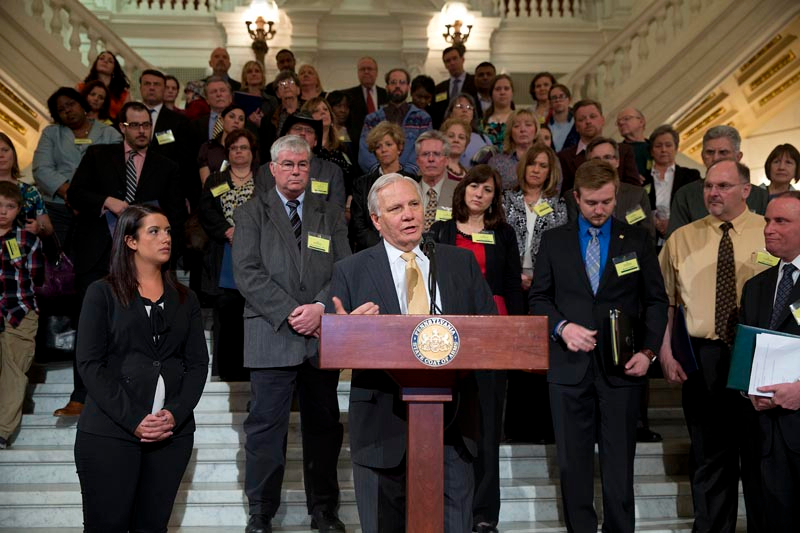 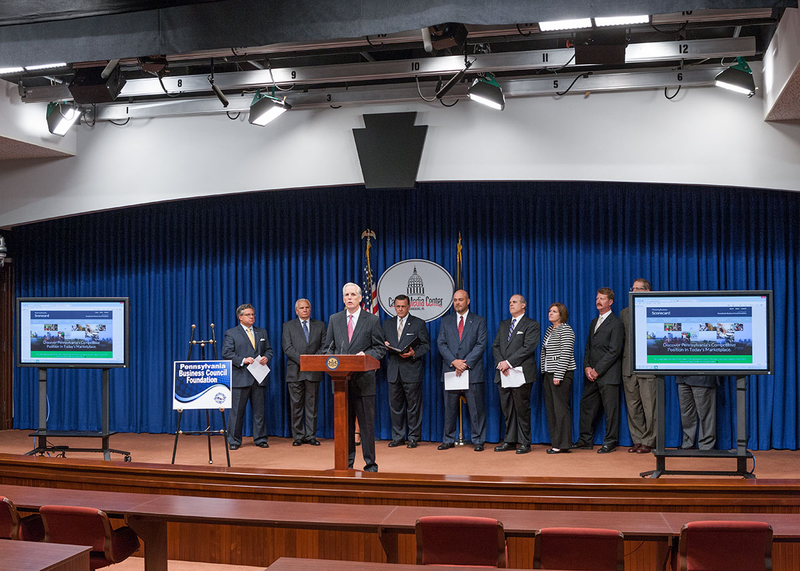 Members of the Senate and Senate staff members listened to SEWN presenters on layoff aversion services free for manufacturing businesses in PA.
Greg Olson, Manufacturing Director of Southeast SEWN, discussed SEWN’s services and their success stories with manufacturing clients. 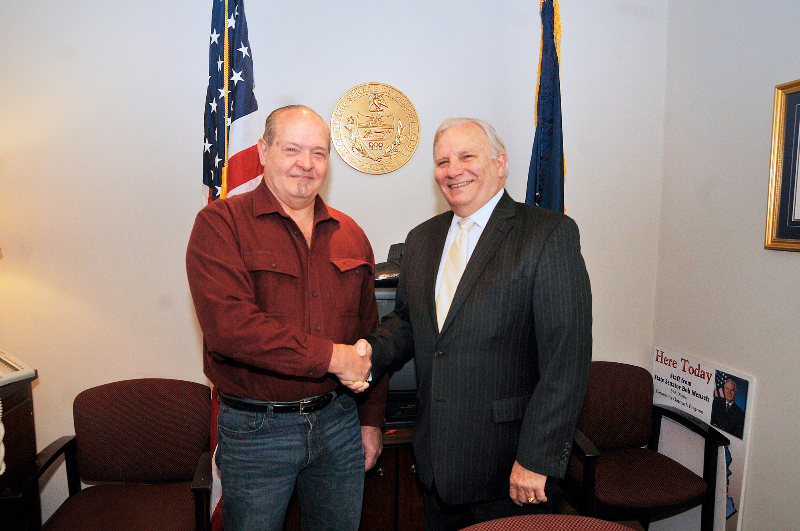 Senator Mensch met with Clyde Hoch, who served in Vietnam in C Company, 1st Tank Battalion, 1st Marine Division, and has written several books about his wartime experiences. 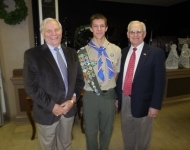 Senator Mensch (left) and Representative Clymer (right) attended Evan Kaseman's Eagle Scout ceremony and honored him with citations. 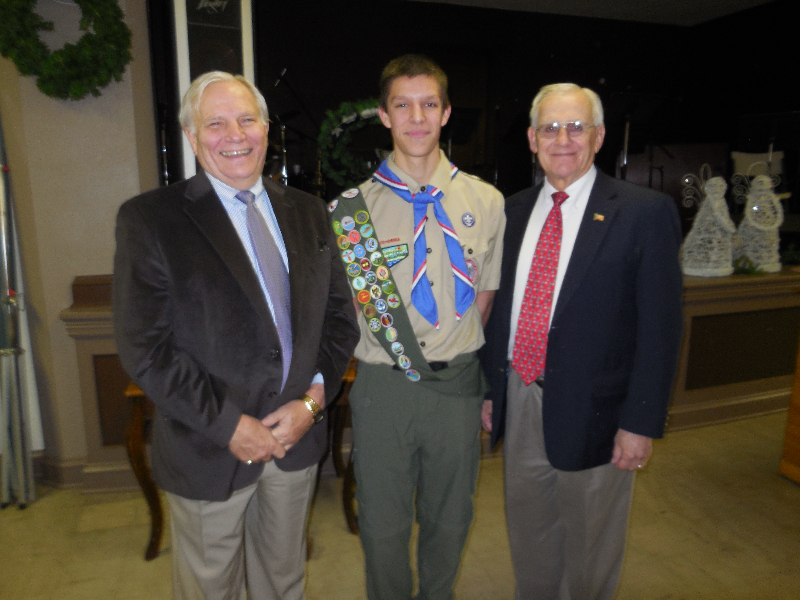 Congratulations Evan! 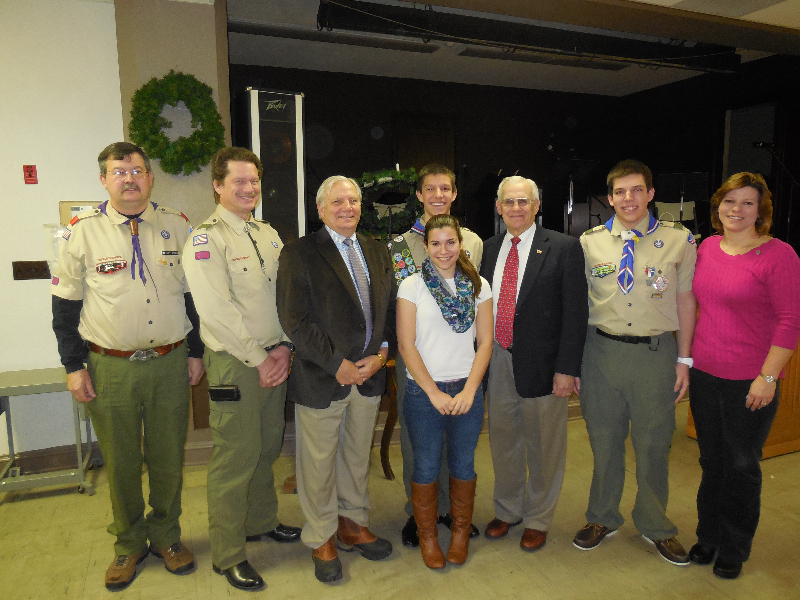 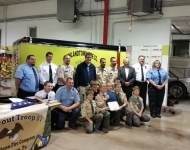 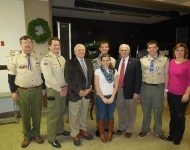 Senator Mensch and Representative Clymer join the family and troop leaders of Evan Kasemen (middle) during his Eagle Scout ceremony. 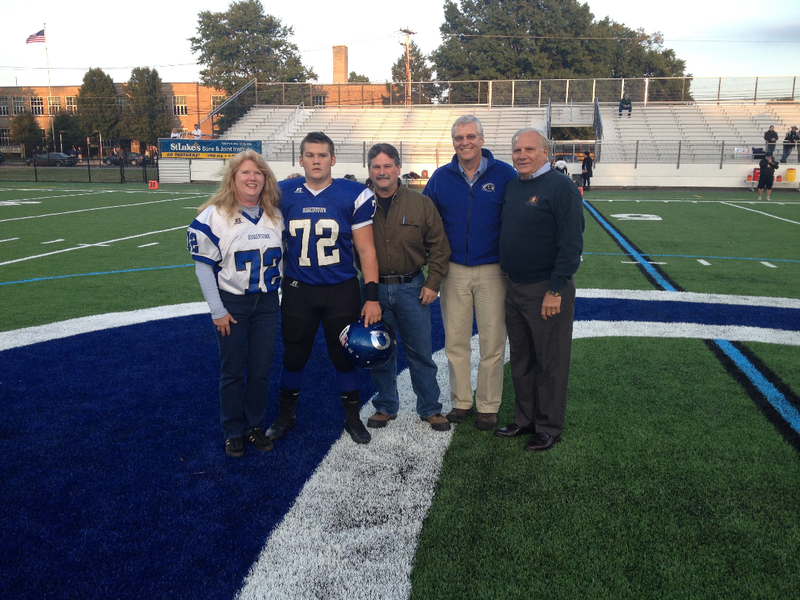 Congratulations Evan!